本发明涉及牙科材料，该牙科材料可由非基因毒性的且展现出较之双酚S更小雌激素活性的多元酚制成，同时展现出与传统的BPA衍生的牙科材料性质可比较的诸多性质，例如强度和柔韧性。 The present invention relates to a dental material, the dental material may be non-genotoxic and polyhydric phenols than bisphenol exhibits less S made estrogenic activity, while exhibiting many properties derived from conventional BPA comparable properties of the dental material , such as strength and flexibility. 本发明要求2012年8月9日递交的美国临时申请No. 61 /681，452的优先权，该临时申请公开的内容通过引用并入本文。  The present invention claims August 9, 2012 filed U.S. Provisional Application No. 61 / 681,452, the disclosure of this provisional application is incorporated herein by reference. 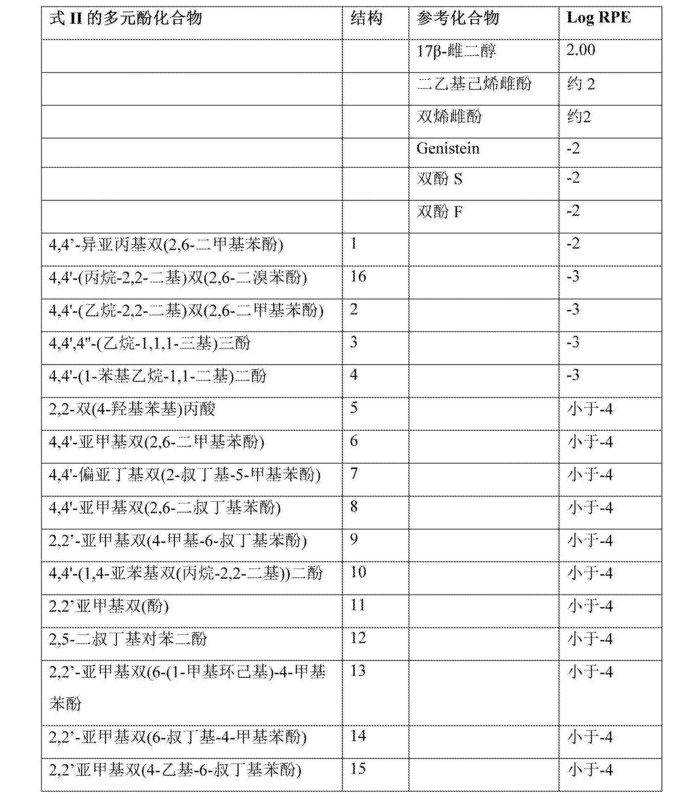 本申请涉及牙科材料和牙科产品。  The present application relates to dental materials and dental products. 牙科材料(例如复合材料)已经用于预防和治疗龋齿(dental carries)和缺陷，除此以外还可以保持牙齿健康。  The dental materials (e.g., composites) have been used for the prevention and treatment of dental caries (dental carries) and defects in addition can also maintain dental health. 牙科复合材料是多种材料的混合物，这些材料通常包含自由基可聚合树脂和分散于可聚合树脂中的填料。 Dental composite material is a mixture of a variety of materials, typically these materials comprise radical polymerizable resin and a filler dispersed in the polymerizable resin. 树脂通常衍生自双酚A (BPA)，并且包含甲基丙烯酸端基。 Resins are generally derived from bisphenol A (BPA), and comprising a methacrylic end group. 实例包括双酚A二缩水甘油基二甲基丙烯酸酯(Bis-GMA)和双酚A二甲基丙烯酸酯(Bis-DMA)。 Examples include bisphenol A diglycidyl dimethacrylate (Bis-GMA) bisphenol A dimethacrylate (Bis-DMA). —个方面，本发明提供牙科材料，其包含填料或自由基聚合引发剂和自由基可聚合树脂，该自由基可聚合树脂具有a)至少一个烯键式不饱和自由基可聚合基团、更优选地端基和b)—个或多个芳基或杂芳基环链段，该链段具有与环相连接的氧原子，在一些实施方式中具有在相对于氧原子的邻位或间位上与环相连的取代基，或者一个或多个通过分子量至少125道尔顿的链接基团或极性链接基团相连的芳基或杂芳基环;并且在一些实施方式中，具有所述取代基和所述极性链接基团二者;其中树脂基本上不含雌激素活性大于或等于双酚S雌激素活性的结合或活动的多元酚。  - aspect, the present invention provides a dental material comprising a filler or a radical polymerization initiator and a radical polymerizable resin, the radical polymerizable resin having a) at least one ethylenically unsaturated radically polymerizable group group, more preferably an end group, and b) - one or more aryl or heteroaryl ring segment, the segment having an oxygen atom in the ring is connected, having in some embodiments, with respect to the oxygen atom ortho para or meta position on the substituents attached to the ring, or one or more aryl or heteroaryl ring of at least 125 daltons molecular weight through a linking group or linking group attached to a polar; and in some embodiments , said substituent having both a polar group and a linking group; wherein the resin is substantially free of estrogenic activity equal to or greater than a bisphenol S estrogenic activity or binding activity of polyhydric phenols. •两个或多个R1或R2基团可以连接形成一个或多个环状基团，并且可聚合树脂包含至少一个且优选地两个自由基可聚合基团，该自由基可聚合基团优选地为端基，并且其中该组合物基本上不含雌激素活性大于或等于双酚S雌激素活性的多元酚。  • two or more R1 or R2 groups may be linked to form one or more cyclic groups, and the polymerizable resin comprises at least one and preferably two free radical polymerizable groups, the radical polymerizable group is preferably a terminal group, and wherein the composition is substantially free of estrogenic activity equal to or greater than a polyhydric phenol and bisphenol S estrogenic activity. 当t为1时，式I的链段是下式IA的链段。  when t is 1, the segment of Formula I is a segment of the formula IA. 当t为0时，式I的链段是下式IB的链段。  When t is 0, the segment of Formula I is a segment of the formula IB. 将填料或聚合引发剂和自由基可聚合树脂混合，该树脂包含式I中所示的链段，其中H、!?1、! ?2^、'»、]!和t如上式I所描述。  The filler or radical polymerization initiator and polymerizable resin mixture, the resin comprises segments of formula I, where H,!? 1,!? 2 ^, ' »,]! T above formula, and I described. 本文中使用时，不使用量词和使用量词“一个”、“一种”、“至少一个”以及“一个或多个”、“一种或多种”可以互换使用。  When used herein, without the use of quantifiers and quantifier use of "a", "an", "at least one" and "one or more", "one or more" are used interchangeably. 因此，例如包含树脂的牙科材料指的是该牙科材料可以包含“一个或多个”树脂或“一种或多种”树脂。 Thus, for example, a resin containing a dental material means that the dental material may comprise "one or more" resin or "one or more" resins. 术语“芳基”（例如亚芳基)指的是闭合的芳香族环或环体系，例如亚苯基、亚萘基、 亚联苯基、亚荷基(f Iuorenylene)和讳基，以及杂亚芳基(heteroarylene)(例如闭合的芳香族或芳香类环状烃或环体系，其中环中的一个或多个原子是除碳之外的元素诸如氮、氧、 硫等）。  The term "aryl" (e.g., arylene) refers to a closed aromatic ring or ring system such as phenylene, naphthylene, biphenylene, Ya Heji (f Iuorenylene) and limb-yl and the heteroarylene group (heteroarylene) (e.g. closed or aromatic or aromatic cyclic hydrocarbon ring system wherein one or more of the atoms in the ring is an element such as nitrogen, oxygen, sulfur, etc. other than carbon). 合适的杂芳基包括呋喃基、噻吩基、吡啶基、喹啉基、异喹啉基、吲哚基、异吲哚基、三唑基、吡咯基、四唑基、咪唑基、吡唑基、噁唑基、噻唑基、苯并呋喃基、苯并苯硫基(benzothiophenyl)、咔唑基、苯并噁唑基、嘧啶基、苯并咪唑基、喹喔啉基、苯并噻唑基、萘啶基、异卩惡卩坐基、异噻卩坐基、噪呤基、喹卩坐啉基、卩比嗪基、1-环氧卩比啶基（l-oxidopyridyl)、ί达嗪基、三嗪基、四嗪基、卩惡二卩坐基(oxadiazolyl)、噻二卩坐基（thiadiazolyl)等等。 Suitable heteroaryl groups include furyl, thienyl, pyridyl, quinolinyl, isoquinolinyl, indolyl, isoindolyl, triazolyl, pyrrolyl, tetrazolyl, imidazolyl, pyrazolyl , oxazolyl, thiazolyl, benzofuranyl, benzothiophenyl (benzothiophenyl), carbazolyl, benzoxazolyl, pyrimidinyl, benzimidazolyl, quinoxalinyl, benzothiazolyl, naphthyridinyl, isobutyl Jie Jie bad sitting group, isothiazolyl group sat Jie, noise MTX group, quinoline Jie sit quinolinyl, Jie ratio piperazinyl, 1-piperidinyl ratio of epoxy Jie (l-oxidopyridyl), ί up piperazinyl , triazinyl, tetrazinyl, oxadiazolyl Jie Jie sit yl (oxadiazolyl), thiadiazolyl group sit Jie (thiadiazolyl) and the like. 当这类基团是二价时，它们典型地被称作“亚芳基”或“杂亚芳基”基团（例如亚呋喃基、亚吡啶基等等)。 When such groups are divalent, they are typically referred to as "arylene" or "heteroarylene" groups (e.g., furylene, pyridylene, etc.). 术语“包含”及其变化在说明书和权利要求书中出现时不具有限定含义。  The term "comprising" and variations thereof do not have a limiting meaning where these terms appear in the description and claims. 术语“交联剂”指的是在聚合物之间或者在同一聚合物的两个不区域之间能够形成共价链接的分子。  The term "crosslinker" refers to a molecule or between the polymer capable of forming covalent links between the two regions is not the same polymer. 术语“牙科组合物”或“牙科材料”可互换使用，并且包括复合材料、密封剂、粘接剂(cements)、修复材料（restoratives)、结合剂（bonding agent)、粘结剂（luting agent)、 基底、衬里等等。  The term "dental composition" or "dental materials" are used interchangeably, and include a composite material, sealants, adhesives (Cements), repair materials (restoratives), binding agent (bonding agent), a binder (luting agent), the base liner and the like. 复合材料是适合在牙齿结构中填充大部分空隙的高度填充的糊状物。 Most suitable materials are composite filled voids in the tooth structure of a highly filled paste. 牙科粘接剂是在某种程度上比复合材料不太高度填充且低粘性的材料，并且通常对额外的材料起到结合剂的作用。 Role in dental adhesives are somewhat less highly filled and low viscosity material than the composite material, and generally functions as a binding agent for additional materials. 牙科密封剂通常包含聚合引发剂、树脂、一种或多种颜料，并且无填料含量或低的填料含量。 Dental sealants typically contain a polymerization initiator, a resin, one or more pigments, and no filler content or low filler content. 术语“雌激素活性”或“雌激素激动活性”指的是化合物通过与内源性雌激素受体、 典型地内源性人雌激素受体相互作用来模仿激素样活性的能力。  The term "estrogenic activity" or "estrogenic agonistic activity" refers to the ability of compounds to mimic estrogen-like activity by endogenous estrogen receptors, typically endogenous human estrogen receptor interactions. 在本发明的树脂中，有机基团可以是未被取代的或者被取代的。  In the resin of the present invention, the organic group may be unsubstituted or substituted. 为了简化讨论并陈述整个本申请中所使用的某些专业术语，使用术语“基团”和“片段”来区分允许或者可以被取代的化学物种和不允许或不可以被这样取代的那些化学物种。 To simplify the discussion and presentation entire Certain terminology used in this application, the terms "group" and "moiety" to distinguish or may be substituted to allow chemical species and do not allow or may not be substituted such as those chemical species . 因此，当使用术语“基团”来描述化学取代基时，所描述的化学材料包括未被取代的基团和具有〇、N、Si或S原子(例如在链中，如在烷氧基中）以及羰基或其他常规取代基的基团。 Thus, when the term "group" is used to describe a chemical substituent, the described chemical material includes the unsubstituted group and having a square, N, Si, or S atoms (e.g. in the chain, as in an alkoxy group ) as well as carbonyl group or other conventional substituents. 当使用术语“片段”来描述化合物或取代基时，仅意指包含未被取代的化学材料。 When the term "fragment" is used to describe a compound or substituent, only an unsubstituted chemical means comprising material. 例如，短语“烷基基团”意指不仅包括纯开链饱和烃烷基取代基（例如甲基、乙基、丙基、叔丁基等等），而且包括带有本领域已知的其他取代基(例如羟基、烷氧基、烷基磺酰基、卤素原子、氰基、硝基、氨基、羧基等等）的烷基取代基。 For example, the phrase "alkyl group" is meant to include not only pure open chain saturated hydrocarbon alkyl substituents (e.g. methyl, ethyl, propyl, t-butyl, etc. ), but also with other known in the art substituents (e.g. hydroxy, alkoxy, alkylsulfonyl, halogen atoms, cyano, nitro, amino, carboxy, etc.) alkyl substituents. 因此，“烷基基团”包括醚、齒代烷基、硝基烷基、羧基烷基、羟基烷基、磺基烷基等等。 Thus, "alkyl group" includes ether, substituted alkyl teeth, a nitro group, carboxy group, hydroxy group, sulfo group and the like. 另一方面，短语“烷基片段”仅限于包括纯开链饱和烃烷基取代基，例如甲基、乙基、丙基、叔丁基等等。 On the other hand, the phrase "alkyl moiety" is limited to the inclusion of only pure open chain saturated hydrocarbon alkyl substituents, such as methyl, ethyl, propyl, t-butyl and the like. 本文中使用时，术语“基团”意欲陈述特定的片段以及陈述含有该片段的更宽泛种类的被取代结构和未被取代的结构。 When used herein, the term "group" is intended to set forth specific fragment containing the stated type and a wider segment of the structures substituted and unsubstituted structure. 可以相同或者不相同的基团被称为“独立地”某物。 It may be the same or not the same group is referred to as "independently" something. 术语“（甲基）丙烯酸”包含丙烯酸或甲基丙烯酸或者二者，并且术语“（甲基）丙烯酸酯”包含丙烯酸酯或甲基丙烯酸酯或者二者。  The term "(meth) acrylic acid" includes acrylic or methacrylic acid or both, and the term "(meth) acrylate" includes acrylate or methacrylate, or both. 当对于化合物使用术语“活动”（mobile)时是指，当将经固化的组合物暴露于用于某些限定条件(取决于最终用途）的测试介质时，该化合物能够从固化的组合物中提取/萃取出来。  When the compound of the term "active" (Mobile) means, when the cured composition is exposed to a certain defined conditions (depending on the end use of) a test medium, the compound can be cured from the composition of the extract / extracted. 这些测试条件的一个实例是在25°C下将固化牙科材料暴露于HPLC级乙腈24小时。 Examples of such a condition is tested at 25 ° C for the cured dental material is exposed to HPLC grade acetonitrile for 24 hours. 本文中使用时，术语“有机基团”指的是烃基基团（具有除碳和氢之外的任选的元素，例如氧、氮、硫和娃），其可被分为脂族基团、环状基团或者脂族与环状基团的组合(例如烷芳基和芳烷基基团）。  When used herein, the term "organic group" means a hydrocarbon group (with optional elements other than carbon and hydrogen, such as oxygen, nitrogen, sulfur and baby), which can be divided into aliphatic aromatic group, a cyclic group or combination of aliphatic and cyclic groups (e.g., alkaryl and aralkyl groups). 术语“环状基团”是指闭环的烃基基团，其被分为脂环族基团或芳族基团，其中脂族基团和芳族基团二者均可以包含杂原子。 The term "cyclic group" means a closed ring hydrocarbon group that is classified into an alicyclic group or an aromatic group, wherein both the aliphatic group and aromatic group may each contain heteroatoms. 术语“脂环族基团”指的是具有与脂族基团的那些性质相似的性质的环状羟基基团。 The term "alicyclic group" means a cyclic group having hydroxy and those properties similar to aliphatic groups properties. 本文中使用时，术语“亚苯基”指的是可以具有任何取代基团（包括例如氢原子、卤素、经基团、氧原子、轻基基团等)的六个碳原子的芳环(例如在苯基基团中）。  When used herein, the term "phenylene" refers to a group may have any substituent (e.g. including a hydrogen atom, a halogen, the group, an oxygen atom, a light group, etc.) six carbon atoms aromatic rings (e.g. phenyl groups). 因此，例如，如下芳基基团均为亚苯基环:-C6H4-、-C6H3 (CH3)-和-C6H (CH3) 2C1-。 Thus, for example, the following aryl groups are phenylene rings: -C6H4 -, - C6H3 (CH3) - and -C6H (CH3) 2C1-. 此外，例如，萘基的每个芳环均为亚苯基环。 Further, for example, naphthyl aromatic rings are each phenylene ring. 本文中使用时，术语“多元酚”广义地指具有一个或多个芳基或杂芳基基团（更典型地一个或多个亚苯基)和至少两个与同一芳基或杂芳基环或者不同芳基或杂芳基环相连的羟基基团的任何化合物。  When used herein, the term "polyphenol" broadly refers to having one or more aryl or heteroaryl group (more typically a phenylene group or more) and at least two of the same or an aryl group any hydroxyl group heteroaryl ring or a different aryl or heteroaryl ring attached. 因此，例如，对苯二酚和4，4' -双酚均被认为是多元酚。 Thus, for example, hydroquinone, and 4,4 '- bisphenol polyphenols are considered. 本文中使用时，虽然多元酚典型地在芳环中具有六个碳原子，但是具有其他尺寸的环的芳基或杂芳基基团也被考虑在本发明的范围内。 When used herein, though typically polyhydric phenol having six carbon atoms in the aromatic ring, but having other ring sizes aryl or heteroaryl groups are also contemplated within the scope of the present invention. 术语“优选的”和“优选地”是指在某些情况下可提供某些益处的本发明实施方式。  The terms "preferred" and "preferably" means that in some cases may provide certain benefits, embodiments of the present invention. 然而，在相同或其他情况下，其他实施方式也可能是优选的。 However, under the same or other circumstances, other embodiments may also be preferred. 另外，一个或多个优选的实施方式的叙述不意味着其他实施方式是不可用的，也不旨在将其他实施方式排除在本发明范围外。 Furthermore, the recitation of one or more preferred embodiments does not imply that other embodiments are not available, nor is it intended to exclude other embodiments from the scope of the present invention. 当与可以包含某活动化合物的牙科材料相关使用时，术语“基本上不含”是指所述的自由基可聚合树脂或其固化聚合物包含小于1000份每百万（ppm)的所述活动化合物。  When the active compound may comprise a dental material related, the term "substantially free" means that the radical polymerizable resin or a curable polymer contains less than 1000 parts per million (ppm) of the active compound. 当与可以包含某活动化合物的牙科材料相关使用时，术语“本质上不含”指的是所述的自由基可聚合树脂或其固化聚合物包含小于100份每百万(ppm)的所述活动化合物。 When the correlation using the dental material may comprise an active compound, the term "essentially free" means that the radical polymerizable resin or a curable polymer comprises less than 100 parts per million (ppm) of the activities compound. 当与可以包含某活动化合物的牙科材料相关使用时，术语“本质上完全不含”指的是所述的自由基可聚合树脂或其固化聚合物包含小于5份每百万(ppm)的所述活动化合物。 When the correlation using the dental material may comprise an active compound, the term "essentially completely free" means that the radical polymerizable resin or a curable polymer containing the less than 5 parts per million (ppm) of said active compound. 当与可以包含某化合物的牙科材料相关使用时，术语“完全不含”指的是所述的自由基可聚合树脂或其固化聚合物包含小于20份每十亿(ppb)所述活动化合物。 When the correlation using the dental material may comprise a compound, the term "completely free" means that the radical polymerizable resin or a curable polymer comprises less than 20 parts per billion of the active compound (ppb). 如果使用上述短语但没有术语“活动”（例如“基本上不含BPA”），那么所述牙科材料或组合物包含小于上述量的化合物，而无论该化合物在组合物中是活动的或者与组合物的构成部分结合的。 If the above phrases but no term "mobile" (e.g., "substantially free of BPA"), then the dental material or composition comprising a compound of an amount smaller than the above, regardless of the active compound in the composition or a combination component was bound. 在本文中，通过端点对数值范围的陈述包括该范围内包含的所有数字(例如1到5 包括1、1.5、2、2.75、3、3.80、4、5等等）。  Herein, a statement of numerical ranges by endpoints includes all numbers subsumed within that range (e.g. 1 to 5 includes, 3.80, 4, etc.). 另外，一个区间的公开包括较宽区间内包括的所有子区间的公开(例如1到5公开了1到4、1.5到4.5、4到5等等）。 Further, a range includes disclosure of all subranges Publication included within the broader range (e.g., 1 to 5 discloses 1 to 4, 1.5 to 4.5, 4 to 5, etc.). 本发明的牙科材料包含填料或聚合引发剂或者二者，以及自由基可聚合树脂。  The dental materials of the invention comprises a polymerization initiator or a filler, or both, and a radical polymerizable resin. 示例性填料可以选自适合掺入用于牙科应用的组合物中的各种材料。 Exemplary filler may be selected suitable for incorporation into compositions for dental applications of various materials. 填料是细碎的，并且优选地具有小于约50微米的最大颗粒直径和小于约10微米的平均颗粒直径，所述颗粒直径可通过例如沉降分析仪来测得。 The filler is finely divided, and preferably has less than about 50 microns and a maximum particle diameter less than about 10 microns average particle diameter, the particle diameter can be measured by, for example, sedimentation analyzer. 填料可以具有单峰或多峰(例如双峰）的颗粒尺寸分布。 The filler can have a unimodal or polymodal (e.g., bimodal) particle size distribution. 填料可以是无机材料。 The filler may be an inorganic material. 其还可以是不溶于可聚合树脂的交联的有机材料，并任选地用无机填料填充。 It may also be insoluble in the polymerizable resin crosslinked organic material and optionally filled with inorganic filler. 填料应当优选地是无毒的并且合适在口中使用。 Fillers should preferably be non-toxic and suitable for use in the mouth. 填料可以是透不过射线的、可透过射线的或非透不过射线的。 The filler can be radiopaque ray, ray permeable but non-radiopaque. 任选地，可以采用表面处理（例如硅烷偶联剂)处理填料颗粒的表面，从而增强填料与可聚合树脂之间的结合。  Optionally, surface treatment (e.g. silane coupling agent) treating the surface of the filler particles, thereby enhancing the bond between the filler and the polymerizable resin. 偶联剂可以采用反应性固化基团（例如丙烯酸酯基团、甲基丙稀酸酯基团等)官能化。 The coupling agent may be used reactive curing groups (e.g., acrylate group, methyl acrylic ester groups and the like) functionalized. 合适的无机填料的实例为天然存在的或合成的材料，例如石英，氮化物(例如氮化娃），玻璃(包括硼硅酸盐玻璃，锌玻璃，和衍生自例如Ce、Sb、Sn、Zr、Sr、Ba或Al的玻璃），长石，高岭土，滑石，二氧化钛，和氧化锆-二氧化硅填充物;低莫氏硬度填料，诸如在美国专利4695251中描述的那些；和亚微米二氧化硅颗粒(例如，胶体二氧化硅，和热致二氧化硅，例如由Degussa销售的“AER0SIL” 系列“0X50”、“130”、“150” 和“200” 的二氧化硅和由Cabot Corp.销售的“CAB-O-SIL M5”二氧化娃）。  Examples of suitable inorganic fillers are naturally occurring or synthetic materials such as quartz, nitrides (e.g., baby nitride), glass (including borosilicate glass, zinc glass, and derived from, for example Ce, Sb, sn, Zr, Sr, Ba or Al glass), feldspar, kaolin, talc, titania, and zirconia - silica filler; low Mohs hardness fillers such as those described in U.S. Patent No. 4,695,251 those; alkylene and micron silica particles (e.g., colloidal silica, and thermotropic silica, marketed by Degussa, for example, "AER0SIL" series "0X50", "130", "150" and "200" and a silica Cabot Corp. sales of "CAB-O-SIL M5" baby dioxide). 合适的有机填料颗粒的例子包括填充的或未填充的粉状聚碳酸酯、聚环氧化物和类似物。 Examples of suitable polycarbonate pulverulent organic filler particles include filled or unfilled, polyepoxides, and the like. 优选的填料颗粒为石英、亚微米二氧化硅，以及在美国专利4503169中所述类型的非玻璃质微粒。 Preferred filler particles are quartz, submicron silica, and non-vitreous microparticles of the type described in U.S. Patent No. 4,503,169 in. 还可考虑这些填料的混合物，以及由有机和无机材料制成的组合填料。 Mixtures of these fillers are also contemplated, and a combination fillers made from organic and inorganic materials. 也可以使用氟铝硅酸盐玻璃填料(未经处理的或经硅烷醇处理的）。 May also be used fluoroaluminosilicate glass filler (untreated or silanol treated by). 这些玻璃具有当放置在口腔环境中时在牙齿工作位点释放氟化物的额外好处。 These glasses have the added benefit of releasing fluoride when placed in the oral environment in dental work sites. 典型地，填料颗粒可以以如下量存在于含填料的牙科材料中，基于总牙科材料重量，所述量为约10重量百分数至约90重量百分数、约20重量百分数至约80重量百分数或者约30重量百分数至约70重量百分数。  Typically, the filler particles may be present in the following amounts to the dental material containing a filler, about 90 weight percent to about 10 percent by weight of the total weight of the dental material, based on the amount of about 20 weight percent to about 80 percent by weight or from about 30 weight percent to about 70 weight percent. 可以通过用于固化自由基可聚合材料的任何合适体系来硬化或固化本发明的牙科材料。  may be hardened or cured dental materials of the invention by any suitable free-radical curing systems may be polymeric material. 优选的这种体系包括光引发剂体系和氧化还原固化体系。 Preferred such systems include photoinitiator systems and redox cure system. 氧化还原固化体系有时被称为“化学”固化体系，因为固化可以在未暴露于光或热的情况下发生。 Redox cure systems are sometimes referred to as "chemical" cure system, since the curing may occur without exposure to light or heat. 优选地，光引发剂应当能够在暴露于具有合适波长和强度的光后促进烯键式不饱和片段的自由基交联。  Preferably, the photoinitiator should be capable of promoting free radical crosslinking ethylenically unsaturated moiety after exposure to light of a suitable wavelength and intensity. 可见光引发剂是优选的。 Visible light initiators are preferred. 光引发剂优选地可溶于树脂中。 The photoinitiator is preferably soluble in the resin. 光引发剂可以例如单独用在单部分糊状物、光固化组合物中，或者在具有两种固化模式(光引发的固化和“暗”化学引发的固化）的两部分的糊-糊化学固化体系中与含过氧化物的糊状物组合使用。 The photoinitiator can be used alone, for example, in a one-part paste, the photo-curable composition or cured with two modes (photoinitiated curing and "dark" chemically initiated cure) two-part paste - paste chemical cure system using peroxide-containing paste composition and. 在其他实施方式中，不需要采用光引发剂，并且可以提供牙科材料作为例如化学固化的两部分体系。 In other embodiments, the photoinitiator need not be employed, and may provide chemically cured dental material as two-part systems, for example. 优选的可见光诱导的光引发剂包括樟脑醌(其通常与合适的氢供体诸如胺一起使用）、二芳基碘鐵本身或金属络合物盐、发色团取代的卤甲基-S-三嗪（halomethyI-S-triazine)和卤甲基恶二唑。  Preferred visible light-induced initiators include camphorquinone (which typically use such as with a suitable amine with a hydrogen donor), substituted diaryliodonium salts or metal complexes of iron itself, the chromophore halomethyl -S- triazine (halomethyI-S-triazine) and halomethyl oxadiazole. 尤其优选的可见光诱导的光引发剂包括α-二酮(例如樟脑醌）、 二芳基碘鑰盐(例如二苯基碘鑰氯化物、溴化物、碘化物或六氟磷酸盐)和氢供体(例如胺或胺醇)。 Particularly preferred visible light-induced photoinitiators include α- diketone (e.g. camphorquinone), diaryliodonium salts key (e.g. key diphenyliodonium chloride, bromide, iodide or hexafluorophosphate) and a hydrogen donor (e.g. amine or amine alcohols). 优选的紫外光诱导的聚合引发剂包括酮类，诸如苄基和苯偶姻、以及偶姻仏〇71〇；[11)和偶姻醚(30710；[1161：1161')。  Preferred ultraviolet light-induced polymerization initiators include ketones such as benzyl and benzoin, and benzoin Fo 〇71〇; [11) and acyloin ethers (30710; [1161: 1161 '). 优选的可商购紫外光诱导的聚合引发剂包括2,2-二甲氧基-2-苯基苯乙酮（“IRGACURE 651”）和苯偶姻甲醚（2-甲氧基-2-苯基苯乙酮），均从Ciba-Geigy Corp.获得。 Preferred commercially available ultraviolet light-induced polymerization initiators include 2,2-dimethoxy-2-phenylacetophenone ( "IRGACURE 651") and benzoin methyl ether (2-methoxy-2- phenylacetophenone), both available from Ciba-Geigy Corp..
 光引发剂应当以足以提供所期望的光聚合速率的量存在。  The photoinitiator should be present in an amount sufficient to provide the desired rate of photopolymerization. 该量部分地取决于光源、要暴露于辐射能量的层的厚度、牙科材料中填料量(如果有的话）以及光引发剂消光系数。 The thickness, the amount of filler in dental materials of the layers depends in part on the amount of the light source, to be exposed to radiant energy (if any), and the extinction coefficient of photoinitiators agent. 典型地，基于牙科材料总重量，光引发剂以约0.01重量百分数至约5重量百分数、更优选地约0.03重量百分数至约0.1重量百分数的总量存在。 Typically, based on the total weight of the dental material, a photoinitiator is from about 0.01 weight percent to about 5 weight percent, more preferably is present from about 0.03 weight percent to about 0.1 weight percent of the total amount. 牙科可聚合树脂传统上已经包含BPA衍生物，其衍生自如下单体诸如2,2-双[4-(2-羟基-3-甲基丙烯酰基氧基-丙氧基-)苯基]丙烷(Bis-GMA) ; 2，2-双(4-甲基丙烯酰基氧基-苯基)丙烷(Bis DMA) ; 2,2-双[4-(2-甲基丙烯酰基氧基-乙氧基)苯基]丙烷(EBPADMA); 和2，2-双[4-缩水甘油基-苯基]丙烷(BADGE)，并且包括美国专利No. 3066112 (Bowen)中和美国专利申请公开US 2006/0009540 Al (Jia等）和US 2011/0144230 Al (Koltisko等）中所示出的那些。  The polymerizable dental resin already contains conventional BPA derivatives, which are derived from monomers such as bis [4- (2-hydroxy-3-methacryloyloxy - propoxy -) 2,2-benzene yl] propane (bis-GMA); 2,2- bis (4-methacryloyloxy - phenyl) propane (bis DMA); 2,2- bis [4- (2-methacryloyloxy - ethoxy) phenyl] propane (EBPADMA); and 2,2-bis [4-glycidyl - phenyl] propane (BADGE), and including U.S. Pat. No. 3066112 (Bowen) and U.S. Patent application Publication US 2006/0009540 Al (Jia, etc.) and shown in US (Koltisko etc.) 2011/0144230 Al those. 当固化在配制成的牙科产品中时，这些树脂期望地具有诸多性质，包括良好的耐久性、良好的耐化学性和逼真的(realistic)光学性质。 When formulated into a cured dental products, these resins have many desirable properties, including good durability, good chemical resistance and realistic (realistic graphics or) optical properties. 本发明的牙科材料提供对于BPA-衍生的牙科材料的有效的替代品。  The dental materials of the present invention to provide an effective alternative for BPA- derived dental material. 本发明的自由基可聚合树脂可以通过如下来制备：用本文中所讨论的多元酚和多元酚衍生的单体替换在常规牙科树脂中使用的BPA或BPA-衍生的单体。 A radical polymerizable resin of the present invention can be prepared by: replacing BPA used in conventional dental resin with a polyhydric phenol and polyhydric phenol-derived monomer as discussed herein or derived BPA- monomers. 基于牙科材料总重量，树脂可以以约5重量百分数至约95重量百分数、约5重量百分数至约70重量百分数或者约5重量百分数至约60重量百分数的量存在于本发明的牙科材料中。 Based on the total weight of the dental material, resin may be from about 5 weight percent to about 95 weight percent, from about 5 weight percent to about 70 weight percent, or from about 5 weight percent to about 60 percent by weight present in the dental material of the present invention. 本发明的自由基可聚合树脂优选地不包含衍生自或能够衍生自多元酚双酚A (“BPA”）、双酚F (“BPF”）或双酚S (“BPS”）的任何结构单元，并且优选地不包含衍生自或能够衍生自这种多元酚与二环氧化合物的反应的任何结构单元（例如衍生自BADGE的结构单元）。  The radical polymerizable resin of the present invention preferably does not comprise, or can be derived from polyhydric phenols derived from bisphenol A ( "BPA"), bisphenol F ( "BPF"), or bisphenol S ( "BPS") of any structural units, and preferably does not comprise, or can be derived from any of the structural units derived from reaction of polyhydric phenols with such a diepoxy compound (e.g., a structural unit derived from BADGE). 更优选地，树脂不包含衍生自或能够衍生自雌激素激动活性大于或等于BPS雌激素激动活性的多元酚的任何结构单元。 More preferably, the resin does not contain units derived from or can be derived from estrogenic agonistic activity of greater than or equal to the BPS estrogenic agonistic activity of any structural units polyphenols. 甚至更优选地，树脂不包含(例如基本不含或完全不含） 衍生自或能够衍生自雌激素激动活性大于4，4' -(丙烷-2，2-二基)双(2，6-二溴苯酚）的任何结构单元。 Even more preferably, the resin does not include (e.g., substantially or completely free) can be derived from, or derived from estrogen agonist activity greater than 4,4 '- (2,2-diyl) bis (2,6- dibromophenol) means any structure. 最佳地，树脂不包含衍生自或能够衍生自雌激素激动活性大于2，2-双(4-羟基苯基)丙酸的多元酚的任何结构单元。 Optimally, the resin does not contain units derived from or can be derived from the estrogen agonist activity greater than 2,2-bis (4-hydroxyphenyl) propionic acid of structural units of any of the polyhydric phenol. •存在极性基团。  • the presence of polar groups. 如上式I中所示，当t为1时该链段包含至少两个亚苯基基团（如式IA中所述），当t 为〇时该链段包含至少一个亚苯基基团（如式IB中所述）。  As shown above in formula I, when t is 1, the segment comprises at least two phenylene groups (the formula IA), when t is the square segment comprising at least one phenylene groups (e.g., in the formula IB). 除了所描绘的那些基团外，式IA和IB的每个链段都可以任选地包含一个或多个额外的亚苯基或其他芳基或杂芳基基团。 In addition to those groups depicted in formula IA and IB of each segment may optionally contain one or more additional phenylene group, or other aryl or heteroaryl group. 尽管目前优选的是具有六碳芳香族环的芳基，但应当理解任何其他合适的芳基或杂芳基也可以用来代替式I中所描绘的亚苯基基团，可以在允许的值中适当调节w和V。 Although preferably an aryl group having six-carbon aromatic ring, it should be understood that any other suitable aryl or heteroaryl groups can also be used instead of the phenylene group depicted in formula I, may be allowed values w and adjusted appropriately V. 如上式I中所描绘， 尽管在某些优选实施方式中至少一个R1在环上位于紧邻氧原子的位置，但是每个亚苯基基团的取代基团（例如-0-331和R2)可以位于亚苯基环中相对于彼此的任意位置。 As depicted in formula I above, although in certain preferred embodiments at least one of R1 on the ring positioned proximate an oxygen atom, but substituted phenylene group each group (e.g. -0-331 and R2) can be the phenyl ring located in the alkylene arbitrary position relative to each other. 在式I中所描绘的亚苯基基团被一个或多个其他芳基或杂亚芳基基团替代的其他实施方式中，应当理解同样适用于这种一个或多个其他芳基或杂亚芳基基团的取代基基团。 In the formula I depicted phenylene group substituted with one or more other aryl or heteroaryl arylene groups other alternative embodiments, it should be understood that this is equally applicable to one or more other aryl or heteroaryl group substituted arylene group. 在优选的实施方式中，R1优选地位于在环上相对于氧原子的邻位上。  In a preferred embodiment, R1 is preferably located in the ortho position relative to the ring oxygen atom. 在一些实施方式中，R1位于环上相对于氧原子的每个邻位位置。 In some embodiments, R1 is located at the ring position ortho with respect to each of the oxygen atoms. 尽管不想受理论束缚，但认为一个或多个R1基团位于相对于式I中所描绘的氧原子的邻位上可有益于减小或消除雌激素激动活性。 While not wishing to be bound by theory, it is believed that one or more R1 groups may be located with respect to reducing or eliminating the beneficial estrogen agonist activity in the ortho position depicted in formula I is an oxygen atom. 下文中将详细讨论，当这些组分是活动的时对于缺乏明显的雌激素活性来说R1的益处。 Will be discussed in detail below, when these components are active for a lack of benefit significant estrogenic activity is R1. 在另一个实施方式中，与在每个邻位或间位位置上具有氢原子的类似的多元酚化合物相比，在多元酸化合物的每个芳基环上所存在的一个或多个轻基基团（例如，通过式I 中所示的氧原子质子化来制得的双酚的酚羟基基团）被芳环的一个或多个其他取代基在空间上产生位阻。  In another embodiment, compared to a similar polyhydric phenol compound having a hydrogen atom at each ortho or meta position, or in a ring on each aryl polyacid compound is present two light group (e.g., an oxygen atom shown in formula I by protonation of the phenolic hydroxy groups of bisphenol be prepared) is an aromatic ring or more other substituents steric hindrance in space. 认为优选地在相对于前述羟基的每个邻位位置上具有取代基，以提供最佳的空间效应。 That preferably has a substituent at each ortho position with respect to the hydroxy group on the space to provide the best effect. 我们认为空间位阻可以防止或限制多元酚化合物起到人雌激素受体的激动剂作用的能力。 We believe that steric hindrance may prevent or limit the polyhydric phenol compound functions capacity for estrogen hormone receptor agonist. 优选的R1基团足够“大体积”，以对前述羟基提供合适水平的空间位阻，从而实现所期望的效果。  Preferred R1 groups sufficiently "bulky" to provide a suitable level of steric hindrance of the hydroxyl group to achieve the desired effect. 为了避免任何歧义，当在R1基团的上下文中使用时，术语“基团”既指单个原子(例如卤原子)又指分子(例如两个或多个原子）。 To avoid any ambiguity, as used in the context of the R1 group, the term "group" refers both to a single atom (e.g. a halogen atom) and refers to a molecule (e.g., two or more atoms). 一个或多个R1基团的最佳化学构成、尺寸或构造(例如直链、支链等)可以取决于许多因素，例如包括R1基团在芳基基团上的位置。 One or more preferred R1 group forms a chemical, size or configuration (e.g., straight chain, branched chain, etc.) may depend on many factors, including, for example, the position R1 group on the aryl group. 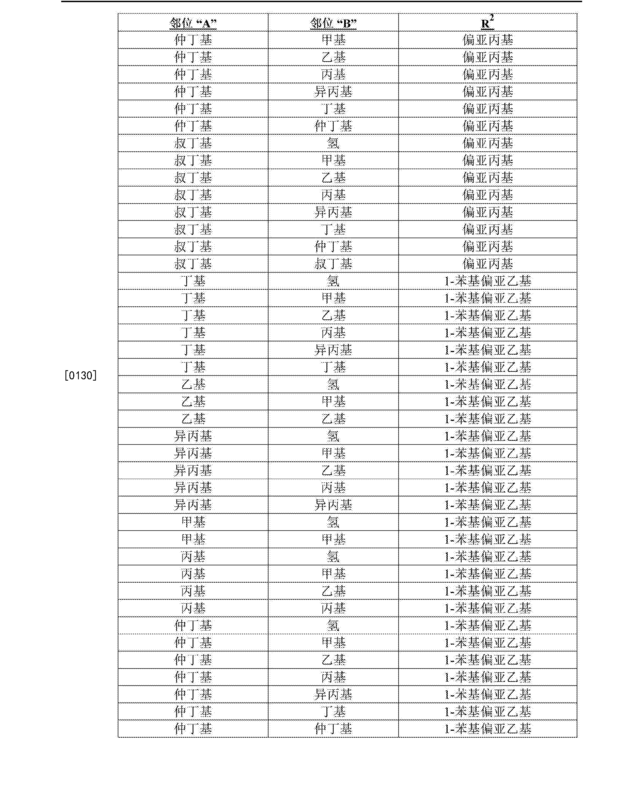 某些优选的式（I)链段包含至多四个原子量至少15道尔顿的R1基团。  Certain preferred compounds of formula (I) segment comprises at least 15 atomic weight of up to four R1 groups Daltons. 在一些实施方式中，式（I)链段包括至多四个原子量至少25、至少40或者至少50道尔顿的R1基团。 In some embodiments, the Formula (I) segment comprises at least 25 atomic weight of at most four, at least 40 or at least 50 daltons R1 group. 尽管未具体限制R1的最大合适尺寸，但典型地为小于500道尔顿、更典型地小于100道尔顿以及甚至更典型地小于60道尔顿。 Although not specifically limit the maximum size suitable R1, but typically less than 500 Daltons, more typically less than 100 Daltons and even more typically less than 60 Daltons. R1基团的非限制性实例包括具有至少一个碳原子(例如有机基团）、齒原子的基团、含硫基团。 Non-limiting examples of R1 groups include having at least one carbon atom (e.g. an organic group), a group of teeth atom, sulfur-containing groups. 在目前优选的实施方式中，如果存在的话，每个亚苯基基团的R1基团优选地包含至少一个碳原子、更优选地1至10个碳原子以及甚至更优选地1至4个碳原子。  In a presently preferred embodiment, if present, each Rl group is preferably a phenylene group comprising at least one carbon atom, more preferably 1 to 10 carbon atoms and even more preferably from 1 to 4 carbon atoms. R1典型地为饱和或不饱和的经基团、更典型地饱和的经基团，其可以任选地包含一个或多个非碳或氢原子的杂原子(例如10、5、51、卤原子等等）。 R1 is typically a group through a saturated or unsaturated, typically saturated by more radicals, which may optionally contain one or more heteroatoms other than carbon or hydrogen atoms (e.g. 10,5,51, a halogen atom and many more). 合适的烃基团的实例可以包含被取代或未被取代的烷基基团（例如甲基、乙基、丙基、丁基等，包括其异构体）、烯基基团、炔基基团、脂环族基团、芳族基团等，或其组合。 Examples of suitable hydrocarbon groups may contain a substituted or unsubstituted alkyl group (e.g. methyl, ethyl, propyl, butyl, etc., including isomers thereof), an alkenyl group, an alkynyl group , alicyclic groups, aromatic groups and the like, or combinations thereof. 在某些优选的实施方式中，式（I)中所描绘的每个亚苯基基团包含至少一个烷基R1基团。  In certain preferred embodiments, each phenylene group in formula (I) as depicted comprises at least one alkyl group R1. 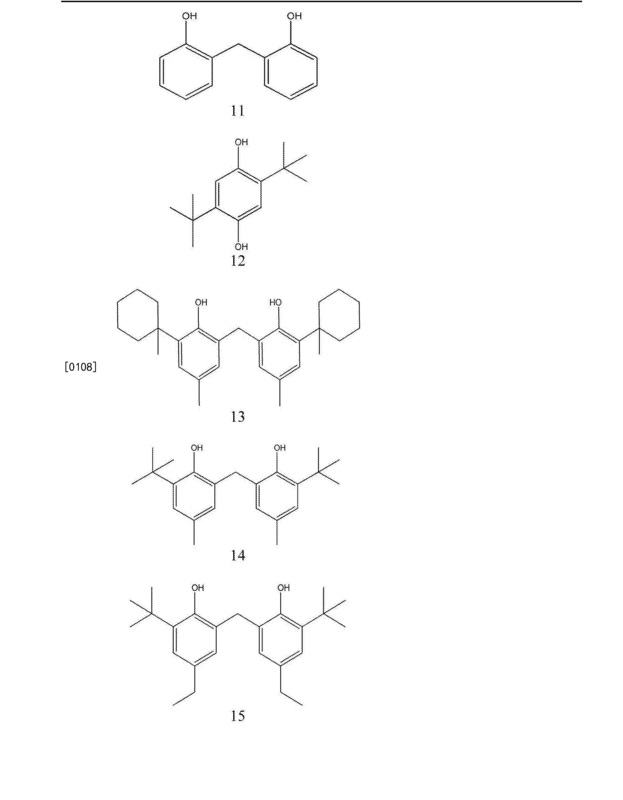 如上文所讨论，可以使用任何合适的异构体。 As discussed above, any suitable isomers. 因此，例如可以使用直链丁基基团或支链异构体诸如异丁基或叔丁基。 Thus, for example, using a linear or branched butyl group chain isomers such as isobutyl or tert-butyl. 在一个实施方式中，叔丁基基团（以及更优选地叔丁基片段)为优选的R1基团。 In one embodiment, the tert-butyl group (and more preferably t-butyl fragment) are preferred R1 groups. 如前面提到，应当理解，R1可以包含一个或多个环状基团。  As mentioned earlier, it will be appreciated that, Rl may comprise one or more cyclic groups. 此外，R1可以与一个或多个其他R1基团或R2形成环状或多环状基团。 Furthermore, R1 may form a cyclic or polycyclic group with one or more other radicals R1 or R2. 在一些实施方式中，式I中所描述的一个或两个亚苯基基团包含R1基团，该R1基团为位于氧的邻位的卤原子、更优选地较高分子量的卤素诸如溴或碘。  In some embodiments, the one or two phenylene groups described in formula I R1 group comprising the R1 group is located ortho to the oxygen of a halogen atom, more preferably a higher molecular weight a halogen such as bromine or iodine. 然而，在优选的实施方式中，式I链段不包含任何卤原子。 However, in a preferred embodiment, the segments of Formula I does not comprise any halogen atoms. 在一些实施方式中，选择合适的R1基团并将其置于邻位，以使从亚苯基基团（或其他合适的芳基基团）的中心线到R1的范德华体积的最大外部范围（maximal outside extent)(对应于R1的范德华半径的半径）的垂直线所测得的宽度“f”大于约4.5埃。  In some embodiments, the selection of suitable R1 groups and placed in the ortho position, so that the van der Waals volume centerline phenylene group (or other suitable aryl groups) to R1 is (corresponding to the radius R1 of the van der Waals radii) outside the range of the maximum (maximal outside extent) of the vertical line width measured "f" is greater than about 4.5 angstroms. 该宽度测量可以经由理论计算采用合适的分子模拟软件来确定，并且说明如下。 The width measurement can be theoretically calculated by using appropriate software to determine the molecular modeling, and described below. 如上面所说明，所描绘的亚苯基基团的中心线包含与酚羟基连接的碳原子和对位的碳原子。  As explained above, the centerline of the depicted phenylene group comprising a carbon atom of a phenolic hydroxyl group and connected to the carbon atom. 例如，尽管不想受理论束缚，但认为如果R2为-C (CH3) 2_基团，则通常期望的是f大于约4.5埃。 For example, while not wishing to be bound by theory, it is believed that if R2 is -C (CH3) 2_ group, it is generally desirable that f is greater than about 4.5 Angstroms. 在一些实施方式中，可以选择R1并将其置于邻位，以使f小于约4.5埃。 In some embodiments, R1 may be selected and placed in the ortho position, so that f is less than about 4.5 Angstroms. 例如，如果R2为亚甲基桥(-CH2-)，在一些实施方式中可以选择R1并将其放置成使得f小于约4.5埃， 相信对于衍生自例如4,4~亚甲基双(2.6-二甲基苯酚）的某些优选式I链段来说就是这种情况。 For example, if R2 (-CH2-), in some embodiments R1 may be selected as a methylene bridge and positioned such that f is less than about 4.5 Angstroms, believed to be derived from such as 4,4-methylene bis - (2.6 - dimethylphenol) of formula I certain preferred is the case for the segment. R2可以是任何合适的二价基团，包括例如含碳基团（其可以任选地包含杂原子诸如10、？、5、51、卤原子等）、含硫基团（包括例如硫原子、亚磺酰基（-3(0)-)、磺酰基（-3 (O2) _)等等）、含氧基团（包括例如氧原子、酮基团等等）、含氮基团或者其组合。  R2 can be any suitable divalent radical, including for example, carbon-containing groups (which may optionally contain heteroatoms such as 10,?, 5, 51, a halogen atom, etc. 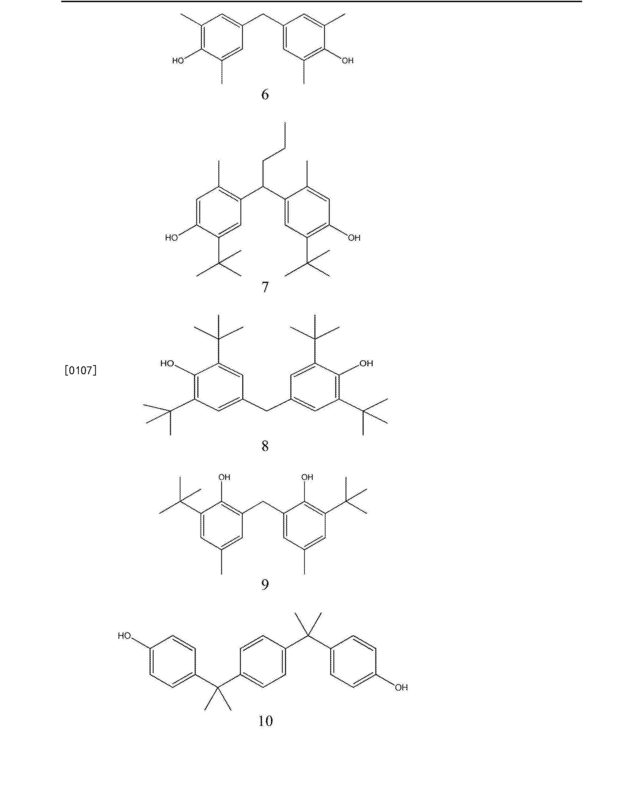 ), sulfur-containing groups (including e.g. a sulfur atom, a sulfinyl group (3 (0) -), sulfonyl (3 (the O2) _), etc. ), oxygen-containing groups (e.g. including an oxygen atom, a keto group, etc. ), nitrogen-containing groups or combinations thereof. 在式（I)中的V为零的实施方式中，R2优选地为极性链接基团或者分子量至少125道尔顿的链接基团。 Embodiment V in formula (I) is zero in, R2 is preferably a polar linking group, or a molecular weight of at least 125 Daltons linking group. 在式IA链段的优选的实施方式中，存在R2,其通常为包含小于约15个碳原子、以及甚至更典型地1或4-15个碳原子的有机基团。  In a preferred embodiment of formula IA segment, the presence R2, which typically comprises less than about 15 carbon atoms, and even more typically 1 or an organic group of 4-15 carbon atoms. 在一些实施方式中，R2包含8个或更多个碳原子。 In some embodiments, R2 contains 8 or more carbon atoms. R2典型地为饱和的或不饱和的羟基团、更典型地为饱和的二价烷基基团、以及最优选地在与二乙基己稀雌酸或双稀雌酸(dienestrol)的运动相类似的方向上不限制所连接的亚苯基基团的运动的烷基基团。 R2 is typically a saturated or unsaturated, hydroxy group, more typically a divalent saturated alkyl group, and most preferably in movement and diethylhexyl acid or dilute female female dilute acid bis (dienestrol) with alkyl groups do not limit movement of the connector in a similar direction phenylene group. 在一些实施方式中，R2可以包含一个或多个环状基团，其可以是芳香族或脂环族并且可以任选地包含杂原子。 In some embodiments, R2 may comprise one or more cyclic groups, which may be alicyclic or aromatic and may optionally contain heteroatoms. R2的一个或多个任选的环状基团可以存在于例如（i)连接两个式IA中所描绘的亚苯基基团的链中，（ii)与连接两个亚苯基基团的链相连的悬挂基团中，或者⑴和（ii)二者中。 One or more optional R2 cyclic groups may be present, for example, (i) connecting the two chains of formula IA, as depicted in the phenylene group, (ii) connecting two phenylene groups chain linked pendant groups, or both ⑴ and (ii),. 如果存在的话，R2基团的原子量可以为任意合适的原子量。  If present, the atomic group R2 may be any suitable atomic weight. 然而，典型地，R2具有小于约500道尔顿、小于约400道尔顿、小于300道尔顿或者小于250道尔顿的原子量。 However, typically, less than about 500 Daltons R2, less than about 400 Daltons, or less than 300 Daltons atomic weight less than 250 Daltons. 在一些实施方式中，R2包含与式I中所描绘的每个亚苯基基团的碳原子相连的碳原子。  In some embodiments, R2 of formula I containing a carbon atom in the depicted carbon atoms per phenylene groups connected to. 例如，R2可以具有式-C(R7) (R8)-的结构，其中R7和R8均独立地为氢原子、卤原子、有机基团、含硫基团或含氮基团，并且其中R7和R8可以任选地连接形成环状基团。 For example, R2 may have the formula -C (R7) (R8) - structure, wherein R7 and R8 are each independently a hydrogen atom, a halogen atom, an organic group, a sulfur-containing group or a nitrogen-containing group, and wherein R7 and R8 may optionally be connected to form a cyclic group. 在一些实施方式中，R7和R8中至少一个为氢原子，并且更优选地二者均为氢原子。 In some embodiments, R7 and R8 is a hydrogen atom, at least one, and more preferably both are hydrogen atoms. 在一个优选实施方式中， R2是二价亚甲基基团（-CH2-)。 In a preferred embodiment embodiment, R2 is a divalent methylene group (-CH2-). 尽管不想受理论束缚，但认为通常地期望的是避免采用其中R7和R8均为甲基(-CH3)基团的R2基团。 While not wishing to be bound by theory, it is believed that generally is desirable to avoid use wherein R7 and R8 are methyl (-CH3) R2 group group. 通常还期望的是避免采用其中R7和R8连接形成单环的环己基基团的R2基团。 It is also generally desirable to avoid the use of R2 groups wherein R7 and R8 are joined to form a monocyclic cyclohexyl group. 避免使用如下“受约束的”不饱和结构（i)或（ii)中的一个作为R2通常也被认为是期望的：⑴-C (R9) =C (R9)-或(ii) -C (=C (Riq) y) -C (=C (Riq) y)-，其中y为1或2,并且每个R9 或R1t3独立地为氢原子、卤原子、有机基团或一价基团。  be avoided as a "constrained" unsaturated structure (i) or (ii) is generally considered as R2 is desirable: ⑴-C (R9) = C (R9) - or (ii) -C (= C (Riq) y) -C (= C (Riq) y) -, wherein y is 1 or 2, and each R9 is independently hydrogen or R1t3 atom, a halogen atom, or a monovalent organic group group. 例如，优选地避免如下不饱和结构（i) 和（ii) : (i) -C (CH2CH3) =C (CH2CH3)-和（ii) -C (=CHCH3) -C (=CHCH3) _。 For example, the following is preferable to avoid the unsaturated structure (i) and (ii): (i) -C (CH2CH3) = C (CH2CH3) -, and (ii) -C (= CHCH3) -C (= CHCH3) _. 尽管不意图受理论束缚，但相信适当低原子量的R2基团诸如-CH2- (14道尔顿)能够有助于避免雌激素活性。  While not intending to be bound by theory, it is believed that appropriate low atomic weight of R2 groups such as -CH2- (14 Daltons) can help avoid estrogenic activity. 在一些实施方式中，当R2为-C(R7) (R8)-基团时，期望的是R2具有小于42道尔顿或小于28道尔顿的原子量。 In some embodiments, when R2 is -C (R7) (R8) - groups it is desirable that R2 having an atomic weight of less than 42 Daltons, or less than 28 Daltons. 也相信，适当高原子量的R2也能够干扰多元酚起到作为人雌激素受体的激动剂的能力。 Also believed suitable high atomic weight polyhydric phenols R2 can also interfere with the ability to play as a human estrogen hormone receptor agonist. 在一些实施方式中，当R2为-C (R7) (R8)-基团，可以期望的是R2具有大于约125、150、175或200道尔顿的原子量。 In some embodiments, when R2 is -C (R7) (R8) - group, R2 may be desirable to have atomic weight greater than about 125,150,175, or 200 Daltons. 举例来说，具有如下特征的二酚化合物已经被确定为明显的非雌激素活性的：（a)未“受阻”的（例如，酚羟基基团未被邻位氢包围）和(b)具有原子量大于200道尔顿的以-C (R7) (R8)-形式的R2基团。 For example, bisphenol compounds having the following characteristics has been determined to be non-significant estrogenic activity: (a) not "blocked" (e.g., a phenolic hydroxyl group being ortho hydrogen surround) and (b) having atomic weight greater than 200 Daltons to -C (R7) (R8) - form R2 groups. 尽管不意图受理论束缚，优选的R2基团包括具有如下特征的二价基团，这种二价基团促进了多元酚化合物在三维构型中的取向与17β-雌二醇或具有雌激素活性的其他化合物(例如己烯雌酸)足够不同。  While not intending to be bound by theory, preferred R2 groups include divalent groups having the following features, which promote a divalent radical polyhydric phenol compound in the orientation of the three-dimensional configuration and 17β- estradiol or other compounds (e.g. hexene female acid) having estrogenic activity sufficiently different. 例如，尽管不想受理论束缚，但认为作为未被取代的亚甲基桥(-CH2-)的R2的存在能够有助于雌激素活性的减小或消除。 For example, while not wishing to be bound by theory, it is believed that the presence of R2 as an unsubstituted methylene bridge (-CH2-) can contribute to the estrogenic activity is reduced or eliminated. 也可以设想，具有一个与亚甲基桥的中心碳原子相连的氢原子的单取代亚甲基桥(-C(R7) (H)-(参见例如4,4' -偏亚丁基双（2_ 叔丁基_5_ 甲基苯酸）df-butylidenebis (2-t-butyl-5_methylphenol))的R2 基团）也可有助于这种有益效果，尽管可能程度较小。 It is also conceivable, having a hydrogen atom attached to the central carbon atom of the methylene bridge mono-substituted methylene bridge (-C (R7) (H) - (see, e.g., 4,4 '- butylidenebis partial (2_ _5_ methyl-tert-butyl benzoic acid) df-butylidenebis (2-t-butyl-5_methylphenol)) R2 groups) can also contribute to this beneficial effect, although to a lesser extent possible. 在一些实施方式中，R2具有式-C(R7) (R8)-，其中R7和R8—起形成包含一个或多个杂原子的环。  In some embodiments, R2 has the formula -C (R7) (R8) -, where R8- and R7 together form a ring containing one or more heteroatoms. 在一个这样的实施方式中，由R7和R8形成的环还包含一个或多个额外的环状基团，例如一个或多个芳香族环状基团（例如两个亚苯基环）。 In one such embodiment, the ring formed by R7 and R8 further comprises one or more additional cyclic groups, for example, one or more aromatic cyclic groups (e.g. 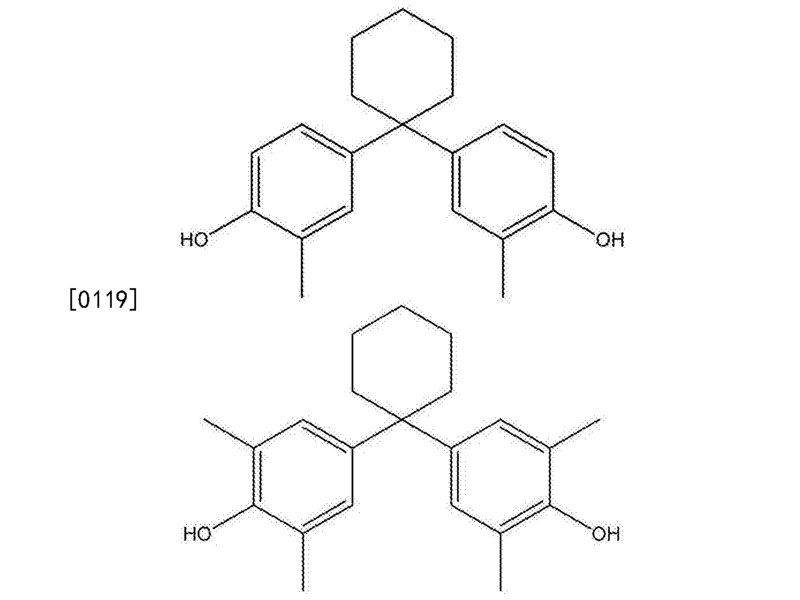 two phenylene rings). 在一个实施方式中，R2具有式-C(R7) (R8)-，其中R7和R8中的一个与所描绘的亚苯基基团的R1形成环。  In one embodiment, R2 having the formula -C (R7) (R8) -, wherein R1 is a R7 and R8 with the depicted phenylene groups form a ring. 在一个这样的实施方式中，R7和R8的每一个均与不同的所描绘的亚苯基基团形成这样的环。 In one embodiment of this embodiment, R7 and R8 are each formed with a different ring such phenylene group depicted. 式I中所描绘的亚苯基环的氧原子可以位于环上相对于R2 (或者，如果R2不存在的话，相对于另一个亚苯基环）的任意位置上。  Formula I depicted phenylene ring oxygen atom may be located anywhere on the ring relative to R2 (or, if R2 does not exist, the phenylene ring relative to the other) on. 在一些实施方式中，氧原子(优选地为醚氧)和R2位于相对于彼此的对位上。 In some embodiments, an oxygen atom (preferably an ether oxygen) and R2 is located with respect to one another on the para position. 在其他实施方式中，氧原子和R2可以位于相对于彼此的邻位或间位上。 In other embodiments, the oxygen atom and R2 may be positioned with respect to one another on the ortho or meta position. 在一些实施方式中，式IA的被取代的亚苯基基团相对于彼此是对称的。  In some embodiments, the substituted phenylene group of formula IA is symmetrical with respect to one another. 除另有说明外，被取代的亚苯基基团优选地由相同的酚化合物形成，从而导致在每个环上位于相同的环位置上的相同的取代基团。 Unless otherwise indicated, the substituted phenylene group is preferably formed of the same phenol compound, resulting in the same substituent group on the same ring position on each ring. 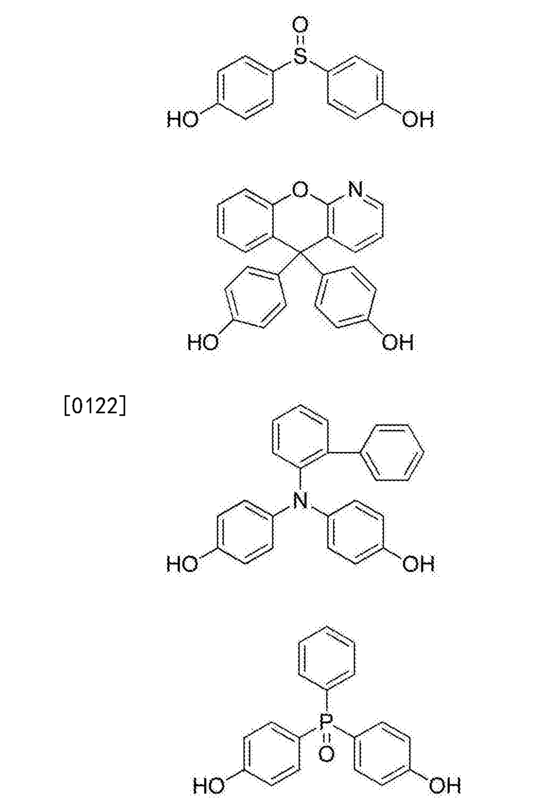 下面提供具有对称的亚苯基基团的化合物的一个实例。 Examples of compounds having a phenylene group symmetric below. 下面提供具有非对称的亚苯基基团的化合物的一个实例，其中甲基在一个环上处于间位，在另一个环上处于邻位。  The following provides an example of a compound having a phenylene group asymmetrical, with methyl in the meta position on a ring in the ortho position on the other ring. 当t为1时，式II的化合物具有下式IIA。  When t is 1, the compound of Formula II has the Formula IIA. 当t为0时，式II的化合物具有下式IIB。  when t is 0, the compound of Formula II has the following formula IIB. 优选的明显无雌激素活性的化合物展现出一定程度的雌激素激动剂活性，在有效的体外人雌激素受体试验中，其优选地小于在该试验中4,4' -(丙烷-2,2-二基)二酚的所展现的雌激素激动剂活性，甚至更优选地小于在该试验中双酚S的所展现的雌激素激动剂活性，甚至更优选地小于在该试验中4,4' -(丙烷-2,2-二基)双(2,6_二溴苯酸)的所展现的雌激素激动剂活性，并且最佳地约小于2,2-双(4-羟基苯基)丙酸的所展现的雌激素激动剂活性。  Preferred non-significant estrogenic activity of the compounds show a certain level of estrogen agonist activity in vitro and effective human estrogen receptor assay, it is preferably less than the assay 4,4 '- (propane 2,2-diyl) diphenol exhibited estrogen agonist activity, even more preferably less than estrogen agonist activity in this assay exhibited bisphenol S, even more preferably less than in the test 4,4 '- (2,2-diyl) bis (2,6_ dibromobenzene acid) exhibited by estrogen agonist activity, and most preferably less than about 2,2-bis (4 - hydroxyphenyl) propionic acid of estrogen agonist activity exhibited. 已经发现诸如4,4' -亚甲基双（2,6-二叔丁基苯酚）、2,2' -亚甲基双(4-甲基-6-叔丁基苯酚）、4,4' -亚甲基双(2,6_二乙基苯酸）、4,4' -偏亚丁基双(2-叔丁基-5-甲基苯酸)和2， 5-二叔丁基对苯二酚等的化合物在合适的体外试验中未展现出明显的雌激素活性，通过常见参考化合物的分析，该体外试验的结果被认为与MCF-7细胞增殖试验（“MCF-7试验”）的结果直接相关。 It has been found, such as 4,4 '- methylene bis (2,6-di-t-butylphenol), 2,2' - methylene bis (4-methyl-6-t-butylphenol), 4,4 '- methylene bis (2,6_ diethylbenzene acid), 4,4' - partial butylene bis (2-tert-butyl-5-methyl benzoic acid) and 2,5-di-tert-butyl hydroquinone compound in a suitable in vitro assays did not show significant estrogenic activity, by analyzing a common reference compounds, the results of in vitro tests is considered to MCF-7 cells proliferation assay ( "MCF-7 test" ) the results are directly related. MCF-7试验是用于评估多元酚化合物是否是明显非雌激素性的有用的测试。  MCF-7 test is used to assess whether a polyhydric phenol compounds are useful as non-significant test estrogenic. MCF-7 试验使用MCF-7克隆WS8细胞来衡量物质是否以及在何种程度上通过雌激素受体(ER)介导的途径诱导细胞增殖。 Test Using MCF-7 MCF-7 cells measured by cloning pathway WS8 whether and to what extent the estrogen receptor (ER) mediated by substance induce cell proliferation. 该方法描述于CertiChem有限公司在2006年1月19日向美国国家毒理学项目替代性毒理学方法跨部门评估中心（NICEATM)提交校验的〃Test Method Nomination:MCF-7 Cell Proliferation Assay of Estrogenic Activity〃（可在iccvam· niehs · nih · gov/methods/endocrine/endodocs/SubmDoc · pdf在线获得)中。 This method is described in CertiChem Co., filed with the US National Toxicology Program check alternative toxicological methods across sectors Assessment Center (NICEATM) 2006 January 19 of 〃Test Method Nomination: MCF-7 Cell Proliferation Assay of Estrogenic Activity〃 (available in iccvam · niehs · nih · gov / methods / endocrine / endodocs / SubmDoc · pdf online) in. 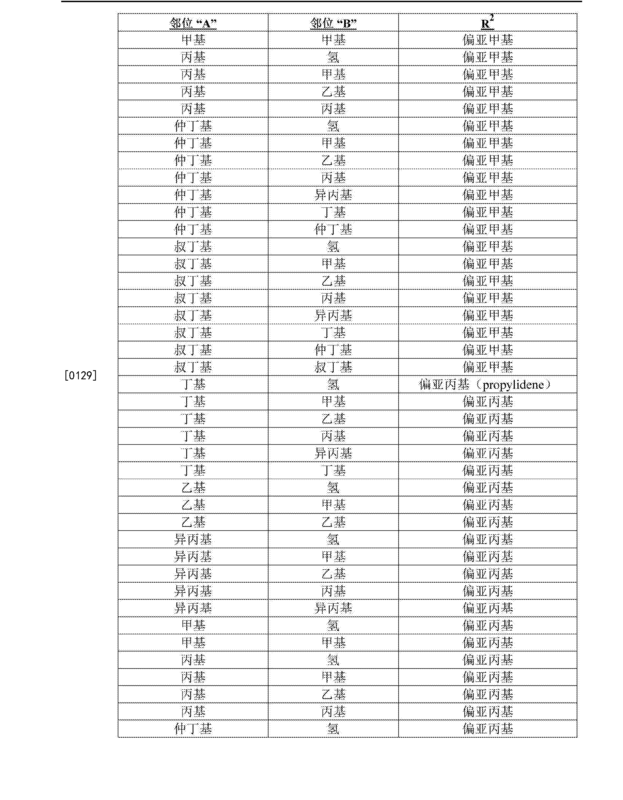 下面简要总结上文中提到的MCF-7试验方法。  MCF-7 test method mentioned above briefly summarized below. 将MCF克隆WS8细胞(MCF，clone WS8 cells)保持在37°C下在含有酸红的RMPI (或Roswell Park Memorial Institute培养基） (例如GIBCO目录号11875119)中，并补充用于常规培养的指示的添加剂。 The MCF WS8 cell clones (MCF, clone WS8 cells) maintained at 37 ° C for red in RMPI containing an acid (or Medium Roswell Park Memorial Institute) (e.g., GIBCO Catalog No. 11875119) supplemented with the conventional cultivation for indicating additives. 将保持在37°C下的一份细胞在25cm2组织培养瓶中在含有5%的经活性炭脱色的胎牛血清的无酚培养基中生长两天。 Maintained at 37 ° C for the cells in a 25cm2 tissue culture flasks in growth medium containing FBS lacking phenol decolorizing carbon 5% in two days. 然后使用自动分散器例如来自Eppendorf AG的ΕΡΜ0ΤΙ0Ν™ 5070单元，在Corning 96孔板中将MCF-7细胞按每孔400个细胞接种在0.2ml的无激素培养基。 Then, for example, using an automatic dispenser unit ΕΡΜ0ΤΙ0Ν ™ 5070 from Eppendorf AG, the 400 cells in Corning 96-well plates in the MCF-7 cells per well were seeded in 0.2ml of hormone-free medium. 在添加要测雌激素活性的化学品之前，使细胞在无激素培养基中适应3天。 To be measured prior to the addition of chemicals estrogenic activity, the cells adapt to hormone-free medium for 3 days. 每天更换含测试化学品的培养基， 持续6天。 Medium was changed daily containing the test chemical for 6 days. 在暴露于测试化学品7天结束时，移除培养基，将这些孔用0.2ml的HBSS (汉克斯平衡的盐溶液)洗涤一次，然后使用微孔板改进的Burton二苯胺(DPA)试验（用于计算细胞增殖水平)分析量化每个孔的DNA数量。 In chemical exposure to the test 7 days ended, the culture medium was removed, 0.2ml of these apertures with HBSS (Hanks balanced salt solution) was washed once, and then using a microplate improved Burton diphenylamine (DPA) Test (used to calculate the level of cell proliferation) analysis of the amount of DNA in each well was quantified. 明显非雌激素性的多元酚的实例包括使用MCF-7试验测试时表现出如下对数值(基底为10)的相对增殖效应（“RPE”）的多元酚:小于约-2.0、更优选小于或等于-3的RPE、甚至更优选小于或等于-4的RPE。 Examples exhibited  obvious non-estrogenic polyhydric phenols include the use of MCF 7-trial test when the following values ​​of the polyhydric phenol (base 10) of the relative proliferative effect ( "RPE") is: less than about -2.0, and more preferably less than or equal to the RPE -3, and even more preferably less than or equal to the RPE -4. RPE是测试化学品的EC50与对照物17-β雌二醇的EC50之比乘以100,其中EC50为在MCF-7试验中以总DNA测得的细胞增殖的“有效浓度50%”或半-最大刺激浓度。 RPE than 17-β estradiol control EC50 EC50 of test chemical was multiplied by 100, wherein the EC50 of the MCF-7 assay in a total DNA measured in cell proliferation, "50% effective concentration" or semi- - maximum stimulation concentrations. 下表1示出了包括式II的示例性优选的多元酚化合物以及它们在MCF-7试验中预期或测得的对数RPE值。  Table 1 shows the formula II include exemplary preferred polyhydric phenol compound and logarithmic values ​​RPE their intended assay in MCF-7 or measured. 当在固化的牙科材料中可能存在任何未反应的、残留化合物时，不具有明显雌激素活性的化合物是有益的。  When the compound may present any unreacted in the cured dental materials, when compound residue, having no significant estrogenic activity is beneficial. 尽管科学数据的平衡并不表示在树脂中存在极少量的具有雌激素活性的残留化合物(例如在体外重组细胞实验中测得的)会引起人类健康问题，但从公众认知的观点来看，使用在所述试验中没有明显的雌激素活性的化合物是可取的。 Although the balance of scientific data does not indicate the presence of very small amounts of residual compounds having estrogenic activity (e.g., as measured in a cell in vitro recombination experiments obtained) cause human health problems in the resin, but from the viewpoint of public awareness, using no significant estrogenic activity of the compounds is desirable in the test. 因此，在优选的实施方式中，本发明的树脂优选地使用在MCF-7测试中不表现出明显雌激素活性的式II的化合物或包含式I链段的化合物来形成。 Thus, in a preferred embodiment, the resin of the present invention is preferably used in the MCF-7 does not show the test compound significantly estrogenic activity of Formula II or a compound of formula I comprises segments formed. 尽管不希望受理论束缚，如前面所讨论的，我们认为，在式II化合物的各个亚苯基环中相对于各环的酚羟基的一个或更多邻位和/间位存在取代基(例如除氢原子以外的基团）可以减少或有效地消除任何雌激素活性。  While not wishing to be bound by theory, as previously discussed, we believe, a phenolic hydroxyl group substituted for one or more of each ring and ortho / meta-phenylene ring in the presence of each phase of the compound of formula II in group (e.g., other than a hydrogen atom group) may be reduced or effectively eliminated any estrogenic activity. 我们认为，雌激素活性的抑制/消除可能归功于如下的一个或多个原因：（a)酚羟基的空间位阻(其可引起整个多元酚结构与诸如己烯雌酚的雌激素活性化合物足够不同），（b)由于一个或多个取代基的存在，化合物具有更高的分子量，（c)存在极性基团，或者(d)存在相对于R2的邻位羟基基团。 We believe that the inhibition of estrogenic activity / eliminate possible thanks to one or more of the following reasons: (a) a sterically hindered phenolic hydroxyl group (which may cause estrogenic activity throughout the polyhydric phenol compound such as a structure sufficiently different diethylstilbestrol), (b) since the presence of one or more substituent groups, a compound having a higher molecular weight, (c) the presence of a polar group, or (d) R2 is present ortho position relative to the hydroxyl group. 对于某些实施方式来说，在各个亚苯基环的一个或两个邻位的取代是目前优选的，因为我们认为邻位取代可以为羟基基团提供最大的空间位阻。 For certain embodiments, the substituted phenylene ring in a respective one or two vicinal are presently preferred, because we believe that the ortho-substituted to provide maximum steric hindrance is a hydroxyl group. 如前面所讨论的，我们相信除了合适的R1基团的存在的结构特征（前一段落的特征，诸如(b)、（c)和(d))会抑制/消除雌激素活性，甚至在不存在任何R1基团的情况下也是如此。  As previously discussed, we believe that in addition to structural features present in a suitable R1 group (the previous paragraph features, such as (b), (c) and (d)) to inhibit / eliminate estrogenic activity, even the same is true in the absence of any R1 group. 相信分子量可能是与多元酚是否是明显非雌激素性的有关的结构特征。  believe may be related to the molecular weight polyphenols whether it is non-estrogenic obvious structural features related. 例如，虽然不想受理论束缚，但发明人认为:如果多元酚中存在足量的相对“紧密地”包裹的分子量， 那么其就可以防止化合物具有契合(fit)到雌激素受体的活性位点中的能力(无论多元酚是否包含任何邻位或间位R1基团）。 For example, while not wishing to be bound by theory, the inventors believe that: if relatively "tight" package molecular weight polyhydric phenol is present in a sufficient amount, then it can prevent the compound having the active site fit (Fit) to the estrogen receptor the capacity (regardless of polyhydric phenols contain any ortho or meta position R1 group). 式II的多元酚化合物上一个或多个极性基团的存在在制备本发明树脂的某些实施方式、尤其是式IIA的某些实施方式中是有益的。 The polyhydric phenol compound  Formula II or a plurality of polar groups in certain embodiments of the present invention, the resin is prepared, in particular, certain embodiments of formula IIA is beneficial. 极性基团可位于式II的化合物的任意合适位置，包括在R1或R2中。 The polar group may be located in the compound of Formula II any suitable location, including in the R1 or R2. 合适的极性基团可包括酮、羧基、碳酸根、羟基、磷酸根、亚砜及其类似物，本文所公开的任何其它极性基团，和它们的组合。 Suitable polar groups may include any other polar ketone groups, carboxyl, carbonate, hydroxy, phosphate, sulfoxides and the like, as disclosed herein, and combinations thereof. 如果期望，也可以使用式II的如下化合物来制备本发明树脂的某些实施方式。  If desired in some embodiments, it may be used the following compounds of Formula II to prepare a resin of the present invention. 下面提供可以用于制备本发明自由基可聚合树脂的其他多元酚化合物。 Other polyhydric phenol compound  The following can be provided for preparing the radical polymerizable resin of the present invention. 尽管就一个或多个亚苯基环的一个或多个邻位或间位具有大体积取代基基团而言下面所列的二酚结构是未“受阻”的，但如下各个多元酚结构可以用来代替作为“受阻”多元酚的式II化合物，或者补充式II化合物。 Despite the fact that one or more of the one or more ortho or meta phenylene ring having a bulky substituent group-diphenol structure in terms listed below are not "blocked", but each of the following structures may polyphenol as used instead of "hindered" polyhydric phenol compound of formula II, or a compound of formula supplement II. 出于前文中提到的一个或多个原因，这种化合物被认为是明显非雌激素性的。 For one or more reasons previously mentioned, this compound is considered to be non-significantly estrogenic. 对于制备本发明的树脂而言，其中所描绘的每个亚苯基基团都包含一个或两个邻位R1基团（相对于所描绘的氧原子）的式I的链段和所描述的多元酚是目前优选的。  For the preparation of the resin according to the present invention, wherein each of the phenylene group depicted contains one or two vicinal R1 groups (with respect to the depicted oxygen atom) segments of formula I and polyhydric phenols described are presently preferred. 为了进一步说明这种结构，下表2列举了对于给定的亚苯基基团的一个或多个R1和R2 (如果存在的话）的一些非限制性组合。 To further illustrate this configuration, two lists given for a phenylene group or a plurality of R1 and R2 are some non-limiting composition (if present) in the following table. 表2是关于R2的环位置(例如邻、间、对位)时是非限制性的，但是如果存在的话，典型的R2会位于相对于氧原子的对位。 Table 2 R2 on ring position (e.g., ortho, meta, para) when the non-limiting, but if present, typically will be positioned with respect to R2 to oxygen atoms. 标为“邻位A”和“邻位B”的栏表明了在亚苯基基团的各个邻位上存在的R1基团(假设R2并未位于邻位）。 Labeled as "vicinal A" and "vicinal B" column indicates the R1 group present in the respective ortho-phenylene group (assuming R2 is not in the ortho position). 相对于所描绘的氧原子， 位置“A”或“B”均可以为邻位。 With respect to the depicted oxygen atom, position "A" or "B" that can be ortho. 如果R2位于亚苯基基团的邻位，则“邻位B”栏中所列的基团不存在。 If R2 in the ortho position of the phenylene group, the group "vicinal B" listed in the column does not exist. 典型地，尽管不必需，在给定的式I的链段或式II的化合物中的亚苯基基团相对于第二个亚苯基基团是“对称的”，以使相同的邻位基团（如邻位栏“A”或“B”中所描述)位于每个环上相同的邻位。 Typically, although not necessarily, a phenylene group in the compound of a given segment of formula I or formula II with respect to the second phenylene group is "symmetrical", so that the same ortho group (as described in ortho column "a" or "B") is located at the same position on each ring ortho. 表2也列出了R1或R2的独立实例以及R1和R2组合的实例(无论R1相对于氧原子来说是邻位还是对位，无论其他R1是否存在于某个亚苯基基团中，或无论一个或多个R1对于两个亚苯基基团来说是相同的）。  Table 2 also lists examples of R1 or R2 independently of R1 and R2, and examples of the combination of (R1, whether with respect to the oxygen atom is ortho or para position, R1 is present in the other regardless of a phenylene groups, or whether one or more of R1 for the two phenylene groups is the same). 本发明的多元酚诸如式II的那些或包含诸如式I的那些链段的化合物可以被用来制备本发明的自由基可聚合树脂，其中通过使多元酚或化合物反应来使一个或多个且优选地两个自由基活性官能基团（例如烯键式不饱和基团）赋予到树脂中。  The present invention is a polyhydric phenol such as those of formula II or a compound such as those of formula I segment may be used to prepare a radical polymerizable resin of the present invention, wherein the polyhydric phenol or by reacting a compound of one or two and preferably a plurality of free radically active functional group (e.g. ethylenically unsaturated group) imparted to the resin. 丙烯酸酯或甲基丙烯酸酯官能的自由基可聚合树脂是特别优选的。 Acrylate or methacrylate functional radical polymerizable resin is particularly preferable. 制备这种树脂的优选方法包括，通过采用上面提到的Bowen的美国专利3066112中所描述的步骤，使多元酚与缩水甘油基（甲基)丙烯酸酯反应。 A preferred method of preparing such resins include, by use of U.S. Patent 3066112 Bowen step mentioned above as described in the polyhydric phenol with a glycidyl (meth) acrylate. 本发明的树脂可以包含（甲基)丙烯酸酯官能团和环氧官能团，并且如果这样的话， 其可以通过采用Jia等的美国专利申请公开No.US 2006/0009540 Al中所描述的步骤来制备。 Resin of the present invention may comprise (meth) acrylate functional groups and epoxy functional groups, and, if so, which by Jia et U.S. Patent Application 2006/0009540 Al was prepared as described in step Publication No.US employed. 本发明的树脂也可以通过如下来制备:将包含一个或多个式I链段的多元酚(优选地二元酸)转化成多环氧化合物(优选地二环氧化合物），然后使多环氧化合物中的环氧乙烷基团与（甲基)丙烯酸反应，以形成烯键式不饱和的自由基可聚合端基。  The resin of the present invention may be prepared by: containing polyhydric phenol (preferably dibasic acids) one or more segments of formula I is converted into polyepoxides (preferably diepoxy compound), and polyepoxy compound so that the ethylene oxide groups (meth) acrylic acid with, to form an ethylenically unsaturated terminal radical polymerizable groups. 多环氧化合物中的环氧乙烷基团可以经由任何合适的链接键相连，这些链接键包括例如含醚或含酯的键接键。 Polyepoxy compounds in the ethylene oxide groups may be attached via any suitable linkages, these linkages include, for example, an ether or an ester containing bonded key. 多元酚的缩水甘油醚和多元酚的缩水甘油酯是优选的多环氧化合物，其中二缩水甘油醚是尤其优选的。 Glycidyl ethers of polyhydric phenols and polyhydric phenols are preferred polyepoxy compounds, wherein the diglycidyl ether is especially preferred. · !1、1?1、1?2、11、1:、¥和¥如上文中式1所描述；  · 1,1 1,1 2,11,1:, ¥ and ¥ 1 described above Chinese;!?? •优选地，每个R4独立地为氢原子、卤原子或可以包含一个或多个杂原子的烃基基团;并且更优选地每个R4为氢原子。  • Preferably, each R4 is independently a hydrogen atom, a halogen atom or a hydrocarbon group may contain one or more heteroatoms; and more preferably each R4 is a hydrogen atom. R3典型地为烃基，其可以任选地包含一个或多个杂了。  R3 is typically a hydrocarbon group which may optionally contain one or more of the heteroatoms. 优选的烃基基团包括具有一至四个碳原子的基团，其中亚甲基是尤其优选的。 Preferred hydrocarbon groups include groups having one to four carbon atoms, wherein a methylene group is particularly preferred. 在一些实施方式中，R3包含羰基。 In some embodiments, R3 comprises a carbonyl group. 在一个这样的实施方式中，R3包含与式III中所描绘的氧原子相连的羰基(例如在醚链接键中）。 In one such embodiment, R3 contain a carbonyl oxygen atom depicted in formula III is connected (e.g. link in an ether bond). 式III的优选的多环氧化合物是非诱变性的、更优选地非基因毒性的。 , More preferably non-genotoxic polyepoxy compounds are non-mutagenic properties  Formula III is preferable. 评价诱变性和基因毒性的一个有用的测试是被称为体内碱性单细胞凝胶电泳试验(也被称为“彗星”试验）的哺乳动物体内试验。 A useful test to evaluate the mutagenicity and genotoxicity of the body is known as a basic single cell gel electrophoresis test (also called a "comet" test) the test mammal. 该方法描述于Tice，RR“The single cell gel/comet assay:a microgel electrophoretic technique for the detection of DNA damage and repair in individual cel Is . ''Environmental Mutagenesis .Eds. Phillips，DH和Venitt， S.Bios Scientific，0xford，UD，1995,第315-339页。彗星试验中的阴性检验结果指示了化合物无基因毒性，因此是非诱变性的;但阳性检验不能确定性地指示反面，在这种情况下可采用更确定的测试(例如两年饲鼠研究）。 This method is described in Tice, RR "The single cell gel / comet assay: a microgel electrophoretic technique for the detection of DNA damage and repair in individual cel Is '' Environmental Mutagenesis .Eds Phillips, DH and Venitt, S.Bios Scientific.. ., 0xford, UD, 1995, pp. 315-339 comet assay negative test result indicates non-genotoxic compounds, and therefore non-mutagenic; but not definitively indicate a positive test negative, can in this case It determined using the test more (such as two-year rat feeding study). 如果式III的t为0,则V优选地为大于或等于1、更优选地大于或等于2。  If t is of Formula III is 0, then V is preferably greater than or equal to 1, more preferably greater than or equal to 2. 尽管不意图受理论限制，但认为一个或多个R1基团、特别是一个或多个邻位R1基团的存在可以有助于式IIIB的二环氧化物的非基因毒性。 While not intending to be bound by theory, it is believed that one or more R1 groups, especially in the presence of one or more vicinal R1 radicals may contribute to non-genotoxic diepoxide of formula IIIB. 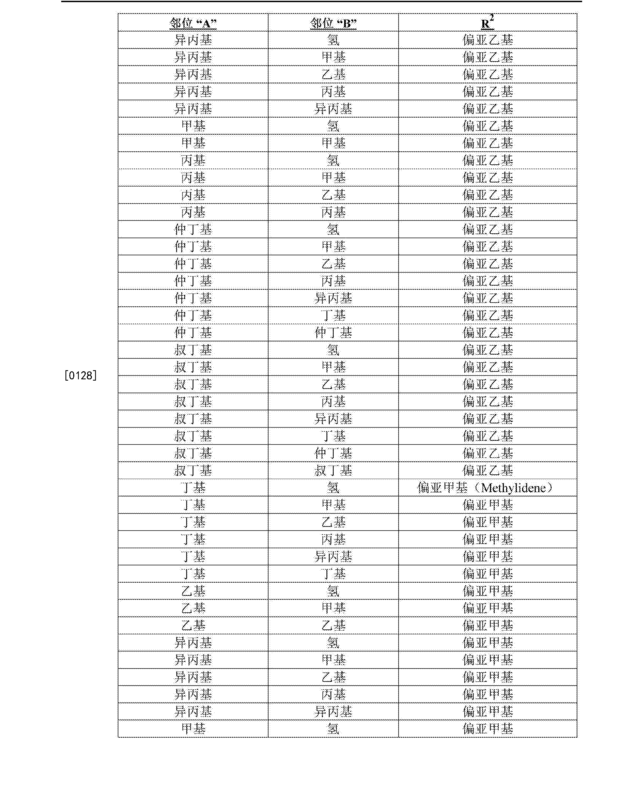 在一个实施方式中，可使用表氯醇来形成式III的二环氧化物。  In one embodiment, the Formula III may be formed using a diepoxide epichlorohydrin. 例如，下面是经由4,4' -亚甲基双(2,6_二叔丁基苯酸)的表氯醇环氧化而形成的二环氧化物。 For example, via the following 4,4 '- methylene bis diepoxide (2,6_ di-t-butyl benzoic acid) epichlorohydrin epoxidized formed. 在另一个实施方式中，可使用表氯醇来形成式III的二环氧化物，并且所得到的二环氧化物可以与烯属不饱和酸或酸酐反应，来提供具有烯属不饱和自由基可聚合基团的树月旨。  In another embodiment of Formula III may be formed using a diepoxide, epichlorohydrin, and the resulting diepoxides may be an ethylenically unsaturated acid or anhydride to provide an ethylenically unsaturated radically polymerizable unsaturated group the tree months purpose. 例如，下式IV是通过如下形成的树脂:表氯醇环氧化形成式III的二环氧化物，然后与(甲基)丙烯酸反应。 For example, the resin of formula IV is formed by the following: epoxidized epichlorohydrin diepoxide of formula III formed is then reacted with (meth) acrylic acid. 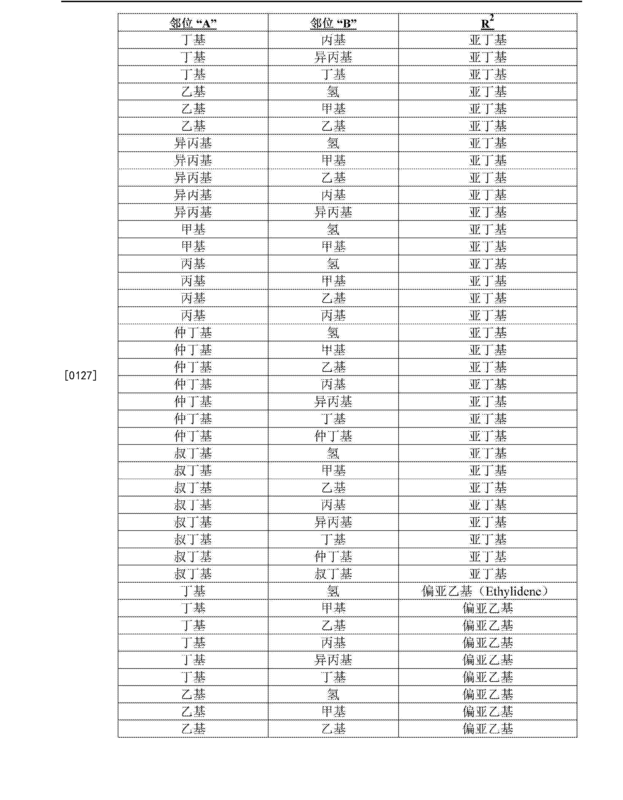 · R3、R4和s如上文中式III的描述。  · R3, R4 and s are as hereinbefore described is of formula III. •每个R11和R12独立地为氢原子、卤原子或可包含一个或多个杂原子的烷基基团； 并且更优选地R11和R12均为氢原子。  • R11 and R12 each independently represent a hydrogen atom, a halogen atom or may contain one or more heteroatoms alkyl group; and more preferably R11 and R12 are hydrogen atoms. 本发明的牙科材料可以包含任选的稀释剂，例如反应性稀释单体。 A dental material  of the present invention may optionally comprise a diluent, such as a reactive diluent monomer. 稀释单体可以用来提高本发明的牙科材料的表面润湿性或降低本发明的牙科材料的粘度。 Diluent monomer may be used to improve the surface wettability of the dental material of the invention or reducing the viscosity of the dental material of the present invention. 示例性稀释单体包括丙烯酸酯、甲基丙烯酸酯、羟基官能的丙烯酸酯、羟基官能的甲基丙烯酸酯以及它们的组合。 Exemplary diluent monomers include acrylates, methacrylates, hydroxy functional acrylates, hydroxy functional methacrylates, and combinations thereof. 优选的稀释单体包括单官能或多官能的（甲基)丙烯酸酯单体，包括烷基（甲基)丙烯酸酯、环烷基（甲基)丙烯酸酯、芳烷基（甲基)丙烯酸酯和2-羟烷基（甲基)丙烯酸酯，例如丁烷二甲基丙烯酸酯，十二烷二甲基丙烯酸酯，（甲基)丙烯酸2-羟乙酯，（甲基)丙烯酸2-羟丙酯，（甲基)丙稀酸异冰片酯，丁二醇（甲基)丙稀酸酯(butyl glycol (meth) acrylate)，乙酰乙二醇（甲基）丙稀酸酯(acetyl glycol (meth) acrylate)，乙二醇（甲基）丙稀酸酯，二乙二醇（甲基）丙烯酸酯，三（乙二醇）二（甲基）丙烯酸酯和四乙二醇二（甲基）丙烯酸酯，聚乙二醇二（甲基)丙烯酸酯，2-苯基乙基（甲基)丙烯酸酯，（甲基)丙烯酸2-乙基己酯，（甲基)丙烯酸环己酯，（甲基）丙烯酸月桂酯，己二醇二（甲基）丙烯酸酯，甘油单或二（甲基）丙烯酸酯，三羟甲基丙烷单或二（甲基)丙烯酸 Preferred diluent monomers include monofunctional or polyfunctional (meth) acrylate monomers include alkyl (meth) acrylates, cycloalkyl (meth) acrylates, aralkyl (meth) acrylates and 2-hydroxyalkyl (meth) acrylates, such as butane dimethacrylate, dodecanediol dimethacrylate, (meth) acrylate, 2-hydroxyethyl (meth) acrylate, 2-hydroxyethyl propyl (meth) acrylic acid, isobornyl acrylate, butanediol (meth) acrylic acid esters (butyl glycol (meth) acrylate), acetyl ethylene glycol (meth) acrylic acid esters (acetyl glycol ( meth) acrylate), ethylene glycol (meth) acrylic acid esters, diethylene glycol (meth) acrylate, tri (ethylene glycol) di (meth) acrylate and tetraethylene glycol di (meth ) acrylate, polyethylene glycol di (meth) acrylate, 2-phenylethyl (meth) acrylate, (meth) acrylate, 2-ethylhexyl (meth) acrylate, cyclohexyl acrylate, (meth) acrylate, lauryl acrylate, hexanediol di (meth) acrylate, glycerol mono- or di (meth) acrylate, trimethylolpropane mono- or di (meth) acrylate, 酯，季戊四醇单、二或三（甲基)丙烯酸酯，山梨醇单、 二、三、四或五（甲基）丙烯酸酯，以及任意这些稀释单体的混合物。 , Pentaerythritol mono-, di- or tri (meth) acrylate, sorbitol mono-, di-, tri-, tetra- or penta (meth) acrylates, and mixtures of any of these monomers diluted. 三（乙二醇）二甲基丙烯酸酯（TEGDMA)是尤其优选的。 Tri (ethylene glycol) dimethacrylate (TEGDMA) is particularly preferred. 合适的稀释单体可从各种商业来源获得J^WnSigma-Aldr ich，St. 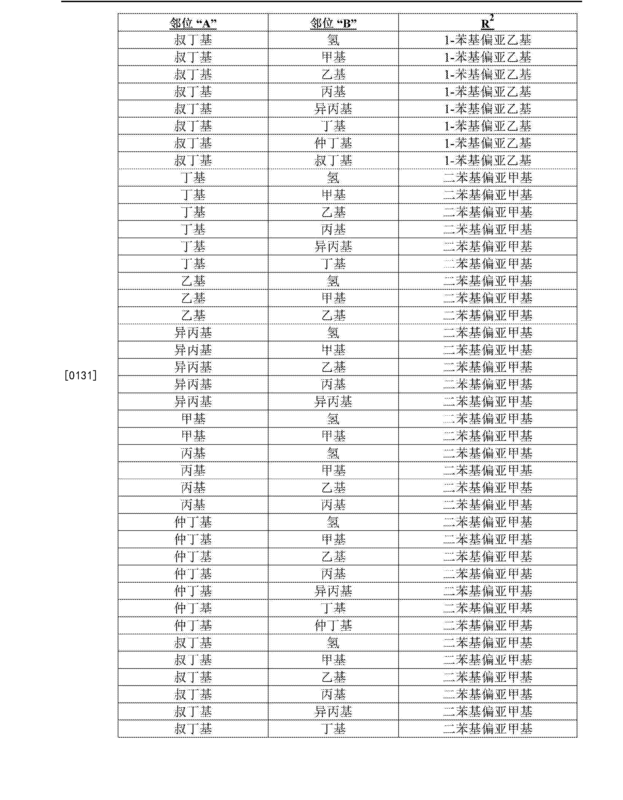 Loui s。 Suitable diluent monomers are available from various commercial sources J ^ WnSigma-Aldr ich, St. Loui s. 当存在时，稀释单体优选地以总牙科材料的约1至约70重量％的量包含于本发明的牙科材料中。 When present, the diluent monomer preferably in an amount of total dental material from about 1 to about 70% by weight of the dental material contained in the present invention. 本发明的牙科材料可以额外地包含适合在牙科材料中使用的佐剂，例如颜料、香条(f I a vorant)、药物、稳定剂、粘度调节剂等等。  The dental material of the present invention may additionally comprise adjuvants suitable for use in dental materials, such as pigments, fragrance strips (f I a vorant), drugs, stabilizers, viscosity modifiers and the like. 这种佐剂可以任选地具有反应性官能团， 以使它们与树脂共聚。 Such adjuvants may optionally have a reactive functional group, so that they are copolymerized with the resin. 可以包含不会对本发明的牙科材料或由其得到的固化牙科修复物产生负面影响的其他任选的成分，来提高美学性质;促进牙科材料的制造、加工、处理和应用;或者进一步改善牙科材料或由其得到的固化牙科修复物的某种功能性质。  may comprise other optional components do not adversely affect the dental material obtained therefrom of the present invention or a cured dental restoration to improve aesthetic properties; facilitate manufacturing, processing, handling and application of dental materials; or further certain dental material therefrom or improving the functional properties of the resulting cured dental restoration. 例如，本发明的牙科材料可以任选地包含交联剂、催化剂、润滑剂、表面活性剂、聚结剂、增量剂、流动控制剂、触变剂、 分散剂、抗氧化剂、粘附促进剂以及它们的混合物，根据需要提供所期望的性质。 For example, the dental material of the present invention may optionally contain crosslinking agents, catalysts, lubricants, surfactants, coalescing agents, bulking agents, flow control agents, thixotropic agents, dispersing agents, antioxidants, adhesion promoters and mixtures thereof, as necessary to provide desired properties. 每种任选成分优选地以足以起到其预期目的的量存在，但不以对牙科材料或由其得到的固化牙科修复物产生负面影响的量存在。 The amount of each optional ingredients preferably in a sufficient amount to serve its intended purpose in the presence of, but does not adversely affect the amount of dental material obtained therefrom or cured dental restoration is present. 优选的牙科材料基本上不含活动的BPA和BADGE，并且优选地本质上不含这些化合物，并且最优选地完全不含这些化合物。  Preferred dental material is substantially free of mobile BPA and BADGE, free of these compounds and preferably in the nature, and most preferably completely free of these compounds. 牙科材料也优选地基本上不含结合的BPA和BADGE， 更优选地本质上不含这些化合物，并且最佳地完全不含这些化合物。 Dental materials also preferably substantially free of bound BPA and BADGE, more preferably free of these compounds in the nature, and optimally completely free of these compounds. 此外，优选的材料也基本上不含、更优选地本质上不含且最优选地完全不含双酚S、双酚F和双酚F或双酚S的二缩水甘油醚。 Furthermore, the preferred material is also substantially free, preferably essentially free of the more and most preferably completely free of bisphenol S, diglycidyl ether of bisphenol F and bisphenol F or bisphenol S.
 本发明的牙科材料可以与其他材料一起使用，例如嵌体（inlay)、高嵌体(onlay) 等，或者如果在一个或多个层中涂覆和固化的话，其本身可以起到填充材料的作用。  The dental materials of the invention can be used with other materials such as inlay (Inlay), onlay (Onlay) and the like, or if the coating and curing in one or more layers, it may function itself effect of the filler material. 还发现，本发明的牙科材料可用作固化制品，该固化制品用于随后放置在口腔中为假体装置。 Also it found that the dental materials of the invention may be used as cured article, the cured article for subsequent placement in the mouth as a prosthetic device. 这种装置的实例包括冠、桥、嵌体、高嵌体、植入物和一般形式，该一般形式可被进一步制造或成型为用于放置在口腔环境中的期望的最终产品。 Examples of such devices include crowns, bridges, inlays, onlays, implants and general form, the general form may be manufactured or shaped to further for placement in the oral environment of the desired final product. 将4,4' -亚甲基双（2,6_二叔丁基苯酚）（500克，1.076摩尔，从Albemarle Corporation得到)在无水二甲基甲酰胺（1.5升）中的溶液冷却到-10°C，并在-10到_5°C下滴加叔戊醇钠(374克，3.23摩尔)在无水二甲基甲酰胺（1.5升）中的溶液。  4,4 '- methylene bis (2,6_ di-t-butylphenol) (500 g, 1.076 mol, available from Albemarle Corporation) in dry dimethylformamide (1.5 liters) of the solution was cooled to -10 ° C, and a solution of sodium tert-pentoxide in anhydrous dimethylformamide (1.5 l) in (374 g, 3.23 mol) at -10 to _5 ° C. 在-HTC下搅拌混合物30分钟。 The mixture was stirred at -HTC 30 minutes. 通过滴液漏斗在-10到-5°C下加入表氯醇（1.9升，24.2摩尔）。 Through a dropping funnel epichlorohydrin was added at -10 to -5 ° C (1.9 L, 24.2 mol). 将溶液温热至室温，然后在75到82°C下加热16小时。 The solution was warmed to room temperature and then heated at 75 to 82 ° C 16 h. 冷却至环境温度之后，将混合物加入冷的自来水（12 升）。 After cooling to ambient temperature, the mixture was added to cold tap water (12 liters). 将乙酸乙酯（5升）加入混合物中，搅拌10分钟并分离。 Ethyl acetate (5 L) was added to the mixture, stirred for 10 minutes and separated. 用额外的乙酸乙酯（3升)再次萃取水层。 The aqueous layer was re-extracted with additional ethyl acetate (3 liters). 合并的乙酸乙酯萃取物用盐水(2x 6升)洗涤两次，用无水硫酸钠(600克)干燥，并过滤。 The combined ethyl acetate extracts were washed with brine (2x 6 L) was washed twice, dried over anhydrous sodium sulfate (600 g) was dried, and filtered. 在降低的压力下除去溶剂，得到887克紫色油状粗制产品。 Under reduced pressure to remove the solvent, to give 887 g of crude product as a purple oil. 将粗制产品溶于甲苯(600 毫升)并通过硅胶垫（1.4千克），用甲苯和庚烷的混合物(8份甲苯与2份庚烧)洗脱。 The crude product was dissolved in toluene (600 mL) and through pad of silica gel (1.4 kg), eluting with a mixture of toluene and heptane (8 parts of toluene and 2 parts of heptane burn). 将含有产品的部分合并，并在降低的压力下蒸发。 The fractions containing the product were combined and evaporated under reduced pressure. 产品大部分是所需的二环氧化物(756克，黄色的油，及时结晶），存在一些单环氧化物。 Most products are required diepoxide (756 g, yellow oil, crystallized in time), there are some monoepoxide. 将纯化的材料(756克)在70°C下溶于2-丙醇(2.3升）， 并冷却至室温一整夜。 The purified material (756 g) was dissolved in 2-propanol (2.3 liters) at 70 ° C, and cooled to room temperature overnight. 将烧瓶放在冰水浴中3小时，过滤，并且用冷的2-丙醇(3x 400毫升） 洗涤固体三遍。 The flask was placed in an ice-water bath for 3 hours, filtered and washed with cold 2-propanol (3x 400 ml) and the solid was washed three times. 所得到的的固体在高真空、环境温度下干燥，以得到白色固体状最终产品(371克，HPLC纯度为95.2%，产率为60%)。 The resulting solid under a high vacuum, drying at ambient temperature, to afford the final product as a white solid (371 g, HPLC purity 95.2%, yield 60%). 最终产品的环氧值为0.367当量/100克。 The final product is 0.367 epoxy equivalents / 100 grams. 使用合适的基团毒性试验（例如Ames II试验)测试所得到的4，4' -亚甲基双(2，6-二叔丁基苯酚） 的二缩水甘油醚，发现了其是非基因毒性的。 Use toxicity test suitable groups (e.g., Ames II test) testing of the obtained 4,4 '- methylene bis (2,6-di-t-butyl phenol) diglycidyl ether, which is found non-genotoxic . 通过使表氯醇与4,4' -偏亚丁基双（2-叔丁基-5-甲基苯酚)反应制备20克批量的4,4' -偏亚丁基双(2-叔丁基-5-甲基苯酚）的二缩水甘油醚。 '- Preparation of 20 g of 4,4 butylene bis partial quantities (2-tert-butyl-5-methylphenol) Reaction' -  by reacting epichlorohydrin with 4,4-bis partial butylene (2-tert butyl-5-methylphenol) diglycidyl ether. 需要多个纯化步骤，以得到合适的纯化产品。 We need more purification steps to obtain products suitable purification. 经纯化的批料表现出的环氧值为0.402当量/100克。 Purified batches exhibited an epoxy value of 0.402 equivalents / 100 grams. 使用合适的基因毒性试验(例如Ames II试验)测试所得到的4,4' -偏亚丁基双(2-叔丁基-5-甲基苯酸）的二缩水甘油醚，发现了其是非基因毒性的。 Using a suitable genotoxicity tests (e.g., Ames II test) testing of the obtained 4,4 '- Partial butylene bis (2-tert-butyl-5-methyl benzoic acid) diglycidyl ether, which is a non gene found toxicity. 在油浴中将4,4'-亚甲基双（2,6_二甲基苯酸）（32克，0.125摩尔）、表氯醇（140毫升，1.79摩尔)和2-丙醇（150晕升)加热至80°C。  In an oil bath 4,4'-methylene-bis (2,6_ dimethylbenzene acid) (32 g, 0.125 mol), epichlorohydrin (140 ml, 1.79 mol) and 2- alcohol (150 liters halo) was heated to 80 ° C. 在5分钟内分批加入在水(20晕升）中的氢氧化钠（12.5克，0.313摩尔）。 Was added portionwise over 5 minutes of sodium hydroxide (12.5 g, 0.313 mol) in water (20 liters halo) was added. 将紫色溶液在80 °C下加热2小时。 The purple solution was heated at 80 ° C 2 hours. 将混合物冷却到室温，过滤并在旋转蒸发仪中在约30-40°C的温度下浓缩。 The mixture was cooled to room temperature, filtered and concentrated at a temperature of about 30-40 ° C in a rotary evaporator. 将剩余的油与二氯甲烷(50毫升)和庚烷（100 毫升)混合，并在环境温度下搅拌30分钟。 The residual oil with dichloromethane (50 mL) and heptane (100 mL) and stirred at ambient temperature for 30 minutes. 通过过滤除去盐，并在旋转蒸发仪中在约30-40°C 下浓缩滤液。 Salts were removed by filtration, and the filtrate concentrated at about 30-40 ° C in a rotary evaporator. 将剩余的油在高真空、环境温度下干燥，直到得到恒定的重量。 The residual oil under high vacuum, drying at ambient temperature, until constant weight. 粗制的产品从甲醇(250毫升）中结晶两次，并在高真空、环境温度下干燥，直到得到恒定的重量。 The crude product was crystallized from methanol (250 ml) twice, and dried under high vacuum, ambient temperature until constant weight is obtained. 实验产生了白色固体状4,4'-亚甲基双(2,6_二甲基苯酸)的二缩水甘油醚(28克，产率为60%)。 Experiment produced a white solid, 4,4'-methylene-bis (2,6_ dimethylbenzene acid) in diethyl ether (28 g, 60% yield). 环氧值为0.543当量/100克。 The epoxy value was 0.543 equivalent / 100 g.
 采用合适的试验由外部毒理学实验室来对用于制备样本I-III中每个样本的二缩水甘油醚所用的多元酚的雌激素活性进行评价，其中基于公知的参比化合物，该结果被认为可与MCF-7试验直接相关联。  using appropriate tests for estrogen activity polyhydric phenol in the preparation of Sample I-III of the diglycidyl ether used in each sample was evaluated by an external Toxicology, wherein based on a known reference compound, this result is believed to be directly associated with the test MCF-7. 将EPON 828二环氧化物和BHT填充到装配有搅拌器、气体入口、热电偶和冷凝器的2升烧瓶中，并在气体喷射下将其加热至108°C。  The EPON 828 diepoxide BHT and filled into a 2 liter flask fitted with a stirrer, a gas inlet, thermocouple and condenser, and a gas injection followed by heating to 108 ° C. 在烧瓶的内容物在108°C下的情况下，在两个小时的过程中用加料漏斗将甲基丙烯酸逐滴添加到批料中，并且在整个添加中温度维持在105°C。 The contents of the flask in the case at 108 ° C, in the course of two hours with an addition funnel was added dropwise methacrylic acid to the batch, and the temperature was maintained throughout the addition at 105 ° C. 甲基丙烯酸添加完成后，该批料保持在该温度15分钟，然后添加N-苄基二甲胺。 After completion of the methacrylic acid, the batch was held at this temperature for 15 minutes, then added N- benzyldimethylamine. 然后将该批料保持在105°C下约11.5小时，此时酸值已经达到13mg KOH/克。 The batch was then held at 105 ° C for 11.5 hours at which time the acid value had reached 13mg KOH / g. 此时，向该批料添加0.8克N-苄基二甲胺和0.8克BHT，并且在105 °C下保持额外的9.5小时，之后酸值为6.7mg 的KOH/克。 At this time, the batch is added to 0.8 g N- benzyldimethylamine and 0.8 g of BHT, and held at 105 ° C for an additional 9.5 hours after which the acid value KOH 6.7mg / g. 然后向烧瓶添加TEGDM，将内容物冷却并倒入容器中。 TEGDM was then added to the flask, the contents were cooled and poured into a container. 将偏亚丁基二缩水甘油醚填充到装配有搅拌器、气体入口、热电偶和冷凝器的烧瓶中，并在气体喷射下将其加热至l〇5°C。  The biasing butylene ether flask equipped with a stirrer was filled into the gas inlet, thermocouple and condenser, and a gas injection followed by heating to l〇5 ° C. 在烧瓶的内容物在105°C下的情况下，在约75分钟的时间上将甲基丙烯酸、BHT和N-苄基二甲胺的混合物逐滴进料到烧瓶中，之后将烧瓶的内容物保持在105 °C下约20小时，并且所得到的最终酸值为0.5mg KOH/克。 The contents of the flask in the case at 105 ° C, in a mixture of about 75 minutes time on methacrylic acid, BHT and N- benzyldimethylamine fed dropwise into the flask, after which the contents of the flask It was maintained for 20 hours at about 105 ° C, and the final acid number obtained was 0.5mg KOH / g. 然后，将烧瓶的内容物冷却到85°C，并添加TEGDMA。 Then, the flask contents were cooled to 85 ° C, and add TEGDMA. 然后冷却并倒出该批料。 The batch was then cooled and poured out. TEGDMA是从Sartomer，USA，LLC Exton，PA获得的。  TEGDMA was obtained from Sartomer, USA, LLC Exton, PA.
 樟脑醌、二苯基碘六氟磷酸盐、BHT、N-苄基二甲胺、甲基丙烯酸和二甲基氨基苯乙醇是从Sigma-Aldrich Corp.，St.Louis，M0获得的。  camphorquinone, diphenyliodonium hexafluorophosphate, BHT, N- benzyldimethylamine, methyl methacrylate and dimethyl amino phenethyl alcohol was obtained from Sigma-Aldrich Corp., St.Louis, M0 of . EPON 828是从Momentive，Columbus，OH获得的。  EPON 828 was obtained from Momentive, Columbus, OH. 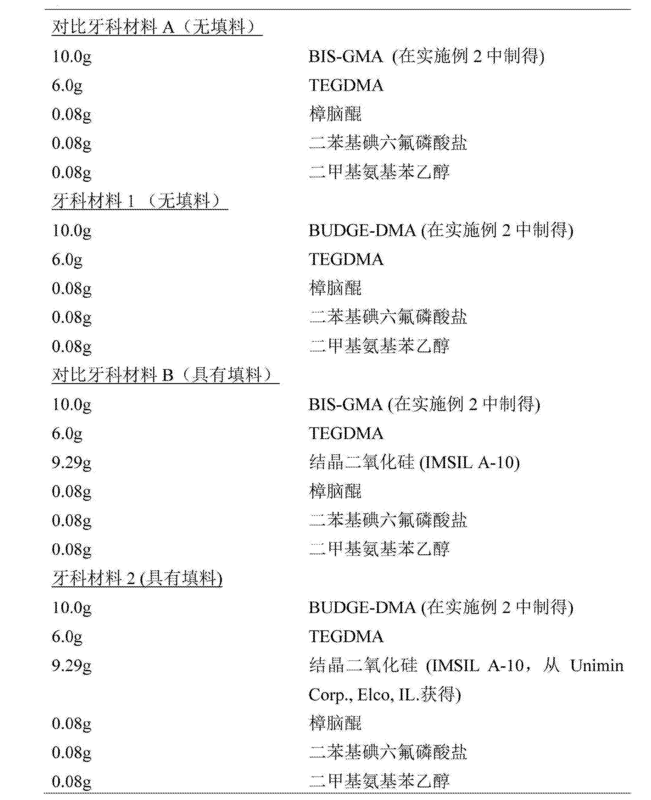 通过将表3中所示的成分混合，来制备牙科材料。  By the ingredients shown in Table 3 were mixed to prepare a dental material. 然后，如下所述，将上述组合物形成条:使用胶带将薄的聚乙烯膜固定在3M™高射投影仪(从3M公司获得)的台板玻璃上。  Then, as described below, the above-described composition is formed article: the use of a thin polyethylene film tape fixed to an overhead projector 3M ™ (obtained from 3M Company) of the platen glass. 使用胶带在平行间隙方向上将两个显微镜载玻片附着于塑料。 Parallel gap with tape on the two directions is attached to a plastic microscope slide. 在载玻片平面中，两个载玻片之间的距离略微小于一个载玻片宽度。 In the slide plane, the distance between two glass slides slightly smaller than a width of the slide. 接下来，使用薄油脂膜将聚乙烯膜附着于第三个显微镜载玻片。 Next, a thin oil film is a polyethylene film attached to a third microscope slide. 然后，在投影仪上两个载玻片之间倾倒上述组合物，并且以如下方式放置第三个载玻片穿过另外两个，该方式为:使其桥连它们之间的间隙并且与前两个载玻片垂直排列。 Then, the projector between two glass slides on the above-described composition was poured, and the third slide is placed through the other two in such a manner that is: it bridged the gap between them and with The first two slides vertically. 将载玻片牢牢摁压，以挤出多余的材料，从而在载玻片之间产生了可聚合的条。 The slides were pressed firmly pressed to squeeze out excess material, thereby producing a polymerizable between the slide bars. 然后将高射投影仪打开，来使材料固化。 The overhead projector was then opened, to cure the material. 对于澄清材料来说，固化时间为60秒，对于填充的材料来说，固化时间为120秒。 For clarification materials, the curing time of 60 seconds, the filling material, a curing time of 120 seconds. 固化后，通过用刀片刮划并分离多余的材料，来将这些条修整成规则的形状。  After curing, by scratching with a blade material and separating the excess to be trimmed into the shape of these pieces of rule. 所得至Ij的条大约为60-70mm长、6-12mm宽和大约Imm厚。 The resulting article to Ij about 60-70mm long, 6-12mm wide, and about Imm thick. 使用动态机械分析仪在约25°C温度、IHz 频率下在0.5%应变帕斯卡下研究这些材料。 Using Dynamic Mechanical Analyzer to study these materials at a strain of 0.5% at about Pascals @ 25 ° C, IHz frequency. 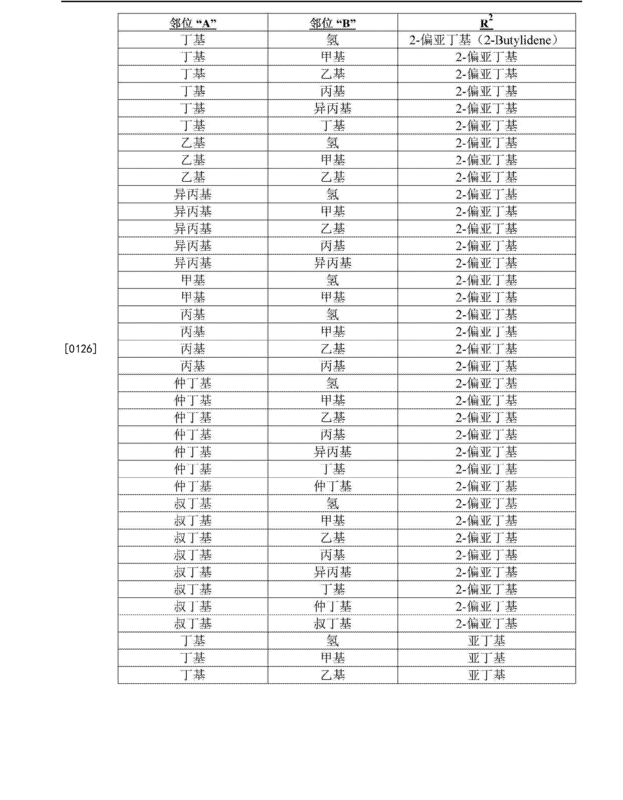 下表4中所示的结果为以帕斯卡(Pa)报道的储能模量(G'）。 The results shown in Table 4 for the storage modulus in Pascals (Pa) reported in (G '). 结果表明了，牙科材料1和牙科材料2较之传统的BPA衍生的牙科材料的机械性质具有可比较的机械性质，但采用的树脂基本上不含雌激素活性大于或等于BPS雌激素活性的多元酚。  The results show that the mechanical properties of dental materials 1 and 2 compared to traditional BPA dental dental materials derived material having comparable mechanical properties, but is substantially free of the resin used in estrogenic activity equal to or greater than estrogen BPS activity of polyphenols. 采用与实施例2中制备BUDGE-DMA相同的方式，可以通过用下表5中所示的多元酚替换BUDGE-DMA，来制备其他树脂。  as in Example 2 prepared in the same manner BUDGE-DMA may be replaced by the following BUDGE-DMA with polyhydric phenols shown in Table 5, to prepare other resins. Τ〇2〇6Ϊ~所得到的树脂较之传统的BPA衍生的牙科材料的机械性质表现出可比较的机械性-质，但该树脂树脂基本上不含雌激素活性大于或等于BPS雌激素活性的多元酚。 The resulting resin Τ〇2〇6Ϊ - mechanical properties than conventional BPA-derived dental material exhibit mechanical properties comparable to, but is substantially free of resin of the resin is greater than or equal estrogenic activity BPS estrogenic activity the polyphenols. 本说明书中所引用的所有专利、专利申请和文献通过引用全部并入本文。 All patents, patent applications, and literature  cited in this specification are incorporated herein by reference in its entirety. 当存在任何不一致情况时，以本文(包括其中的定义)为准。 When there is any inconsistency, to (including therein defined) herein shall prevail. 已经参考各种具体的且优选的实施方式和技术来描述本发明。 The present invention has been with reference to various specific and preferred embodiments and techniques described. 但是，应当理解的是，在本发明的范围内还可以进行许多变化和修改。 However, it should be understood, it may also be many variations and modifications within the scope of the present invention. 1. 一种牙科材料，其包含： 自由基聚合引发剂;和自由基可聚合树脂，所述树脂包含： a) 至少两个烯属不饱和的自由基可聚合端基;和b) 链段，所述链段包含： (i) 二个或多个芳基或杂芳基，其中每个芳基或杂芳基包含与环相连的氧原子和(a)在相对于所述氧原子的邻位或间位上与环相连的乙基、丙基、异丙基、丁基、仲丁基或叔丁基取代基或(b)在相对于所述氧原子的两个邻位上与环相连的两个取代基;并且(ii) 二个或多个芳基或杂芳基，其中所述二个或多个芳基或杂芳基通过未被取代的亚甲基桥(_CH2-)相连； 其中所述可聚合树脂包含小于1000份每百万的雌激素活性大于或等于双酚S的雌激素活性的多元酚。 1. 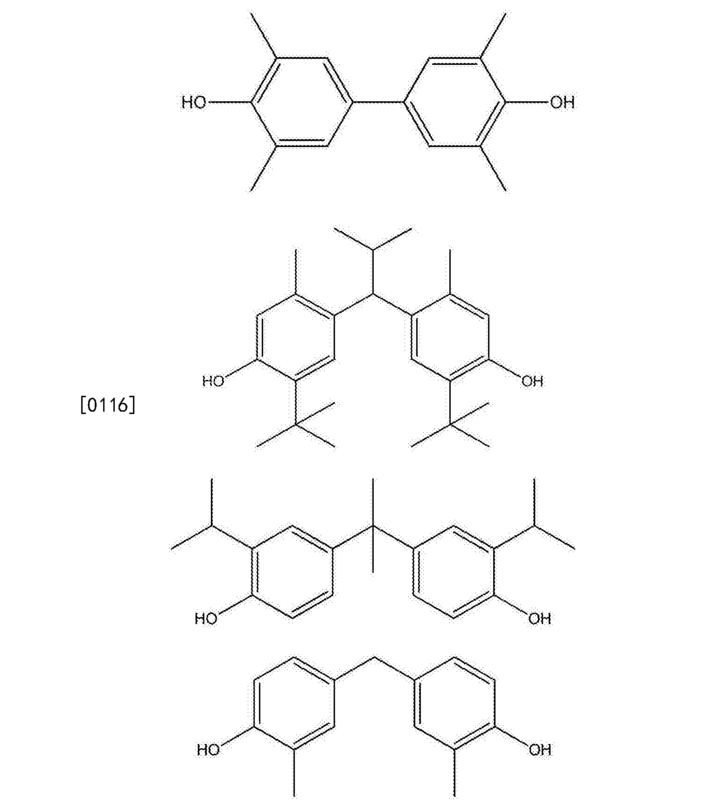 A dental material comprising: a radical polymerization initiator; and a radical polymerizable resin, the resin comprising: a) at least two ethylenically unsaturated terminal radical polymerizable group; and b) a segment , said segment comprising: (i) two or more aryl or heteroaryl groups, wherein each aryl or heteroaryl group containing an oxygen atom attached to the ring, and (a) with respect to the oxygen atom, the ortho or meta position of the ring linked ethyl, propyl, isopropyl, butyl, sec-butyl or tert-butyl substituent group or (b) at the two ortho positions relative to the oxygen atom, and two substituents attached to the ring; and (ii) two or more aryl or heteroaryl groups, wherein the two or more aryl or heteroaryl groups substituted by unsubstituted methylene bridges (_CH2- ) is connected; wherein the polymerizable resin contains less than 1000 parts per million or greater estrogenic activity estrogenic activity polyhydric phenol bisphenol S.
2. 根据权利要求1的牙科材料，其中所述烯属不饱和的自由基可聚合端基包含一个或多个（甲基)丙烯酸酯基团。 2. The dental material according to claim 1, wherein the ethylenically unsaturated free-radically polymerizable (meth) acrylate groups comprises one or more end groups. 其中： 如果存在的话，H表不氢原子； 每个R1是(a)在相对于氧原子的邻位或间位上与环相连的乙基、丙基、异丙基、丁基、仲丁基或叔丁基取代基或者(b)独立地为在相对于所述氧原子的两个邻位上与环相连的原子量至少15道尔顿的原子或基团； V独立地为2至4; w为4; R2为二价未被取代的亚甲基桥(-CH2-); η为1; t为1; 两个或多个R1或R2基团可以连接形成一个或多个环状基团。 Wherein: if present, H table is not a hydrogen atom; each R1 is (a) with respect to the ortho or meta position to the ring oxygen atom attached ethyl, propyl, isopropyl, butyl, sec-butoxy or tert-butyl substituent group or (b) independently with respect to the atomic weight of the two ortho positions of the oxygen atoms attached to the ring at least 15 daltons atom or group; V is independently 2-4 ; W is. 4; R2 is a divalent unsubstituted methylene bridge (-CH2-); η is 1; T is 1; two or more R1 or R2 groups may be linked to form one or more cyclic group. 4. 根据权利要求3的牙科材料，其中式I中所描绘的每个亚苯基基团包含至少一个相对于所述氧原子在邻位上与所述亚苯基环相连的R1基团。 Dental material according to claim 3, wherein each of the phenylene group depicted in formula I comprises at least one relative to the oxygen atom R1 group in ortho position of the phenylene ring attached. 5. 根据权利要求3的牙科材料，其中式I中所描绘的每个亚苯基基团包含相对于所述氧原子在两个邻位上与所述亚苯基环相连的两个独立的R1基团。 The dental material according to claim 3, wherein each of the phenylene group depicted in formula I contains two separate oxygen atoms with respect to the two ortho positions on the phenylene ring attached to the R1 groups. 6. 根据权利要求3的牙科材料，其中一个或多个R1基团独立地包含乙基基团。 6. The dental material according to claim 3, wherein one or more R1 groups independently comprises ethyl group. 7. 根据权利要求3的牙科材料，其中R1基团相对于所述氧原子在邻位上与所述亚苯基环相连，并且从所述亚苯基环的中心线到R1的范德华体积的最大外部范围的垂直线所测得的宽度大于4.5埃。 7. The dental material as claimed in claim 3, wherein the R1 group relative to the oxygen atom of the phenylene ring in ortho position, and from the centerline of the phenylene ring to the van der Waals volume of R1 outside the range of the maximum vertical line width measured greater than 4.5 angstroms. 8. 根据权利要求3的牙科材料，其中一个或多个R1基团独立地包含甲基。 The dental material according to claim 3, wherein one or more R1 groups independently comprise methyl. 9. 根据权利要求3的牙科材料，其中一个或多个R1基团独立地包含叔丁基。 9. The dental material of claim 3, wherein one or more R1 groups independently comprise t-butyl. 10. 根据权利要求3的牙科材料，其中式I中所描绘的每个亚苯基基团的氧原子位于对位，所述对位是相对于R2的。 10. 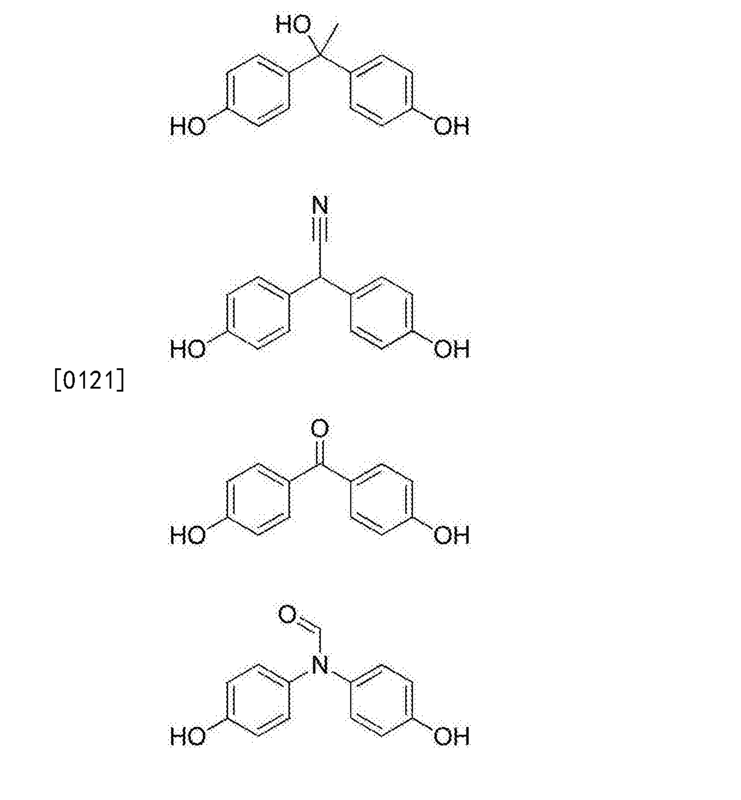 The dental material according to claim 3, wherein in formula I each of the oxygen atoms depicted phenylene group in the para position, the para position relative to R2. 11. 根据权利要求1的牙科材料，其中所述自由基可聚合树脂衍生自如下的一个或多个:4，4' -亚甲基双(2，6-二叔丁基苯酸）的二缩水甘油醚、2，2' -亚甲基双(4-甲基-6-叔丁基苯酸)的二缩水甘油醚、4,4'-亚甲基双(2,6_二甲基苯酸)的二缩水甘油醚或组合。 11. The dental material according to claim 1, wherein the radical polymerizable resin derived from one or more of the following: 4,4 '- methylene bis (2,6-di-t-butyl benzoic acid) II ether, 2,2 '- methylene bis (4-methyl-6-tert-butyl benzoic acid) diglycidyl ether, 4,4'-methylene-bis (dimethyl-2,6_ benzoic acid) diglycidyl ether or a combination thereof. 12. 根据权利要求1的牙科材料，其中所述牙科材料是牙科密封剂，并且还包含颜料。 12. The dental material according to claim 1, wherein the dental material is a dental sealant, and further comprises a pigment. 13. 根据权利要求1的牙科材料，其中所述牙科材料是牙科复合材料或牙科粘接剂，并且还包含填料。 13. The dental material according to claim 1, wherein the dental material is a dental adhesive or a dental composite material, and further comprising a filler. 14. 根据权利要求13的牙科材料，其包含10-90wt%的所述填料、0.1至5wt%的所述自由基聚合引发剂和5至95wt%的所述自由基可聚合树脂。 14. The dental material according to claim 13, which comprises 10-90wt% of the filler, 0.1 to 5wt% of the radical polymerization initiator and 5 to 95wt% of the radical polymerizable resin. 15. 根据权利要求1的牙科材料，其中所述可聚合树脂的链段衍生自多元酚，所述多元酚在MC-7细胞增殖试验中表现出较之双酚S更小的log相对增殖效应值。 15. The dental material according to claim 1, wherein said polymerizable resin segments derived from polyhydric phenols, polyhydric phenols of the bisphenol S exhibits less than log relative proliferation effect in MC-7 cell proliferation assay value. 16. 牙科材料用于制造修复牙齿的牙科修复物的用途，其包括： 将牙科材料涂覆于所述牙齿，所述牙科材料包含： 自由基聚合引发剂； 填料;和自由基可聚合树脂，所述树脂包含： a) 至少两个烯属不饱和的自由基可聚合端基，和b) 链段，其包含： (i) 二个或多个芳基或杂芳基，其中每个芳基或杂芳基包含与环相连的氧原子和在相对于所述氧原子的邻位或间位上与环相连的乙基、丙基、异丙基、丁基、仲丁基或叔丁基取代基或(b)在相对于所述氧原子的两个邻位上相连的两个取代基;并且(ii) 二个或多个芳基或杂芳基，其中所述二个或多个芳基或杂芳基通过未被取代的亚甲基桥(_CH2-)相连； 其中所述可聚合树脂包含小于1000份每百万的雌激素活性大于或等于双酚S的雌激素活性的多元酚;并且使所述牙科材料聚合形成牙科修复物。 16. A dental material for the manufacture of a dental repairing dental restorations, comprising: a dental material applied to the teeth, the dental material comprising: a radical polymerization initiator; fillers; and the radical polymerizable resin, the resin comprising: a) at least two ethylenically unsaturated terminal radical polymerizable group, and b) a segment comprising: (i) two or more aryl or heteroaryl groups, wherein each aryl an aryl group or a heteroaryl group containing an oxygen atom in the ring and attached to the oxygen atom ethyl ortho or meta position of the ring is connected, propyl, isopropyl, butyl, sec-butyl or tert-relative substituent or (b) the two substituents bonded to both ortho positions relative to the oxygen atom; and (ii) two or more aryl or heteroaryl groups, wherein said two or more aryl or heteroaryl group linked via an unsubstituted methylene bridge (_CH2-); wherein the polymerizable resin contains less than 1000 parts per million estrogenic activity is greater than or equal to the estrogenic activity of bisphenol S polyhydric phenol; and the polymerization of the dental material is a dental restoration is formed. 17. 制备牙科材料的方法，其包括将下述物质混合： a)自由基可聚合树脂，所述树脂包含： i) 至少两个烯属不饱和的自由基可聚合基团，和ii) 二个或多个芳基或杂芳基链段，其中所述芳基或杂芳基链段具有与环相连的氧原子和(a)在相对于所述氧原子的邻位或间位上与环相连的乙基、丙基、异丙基、丁基、仲丁基或叔丁基取代基或(b)在相对于所述氧原子的两个邻位上相连的两个取代基;并且所述二个或多个芳基或杂芳基链段通过未被取代的亚甲基桥(-CH2-)相连； 所述树脂包含小于1000份每百万的雌激素活性大于或等于双酚S的雌激素活性的多元酚， b) 聚合引发剂;和c) 任选地，填料。 17. 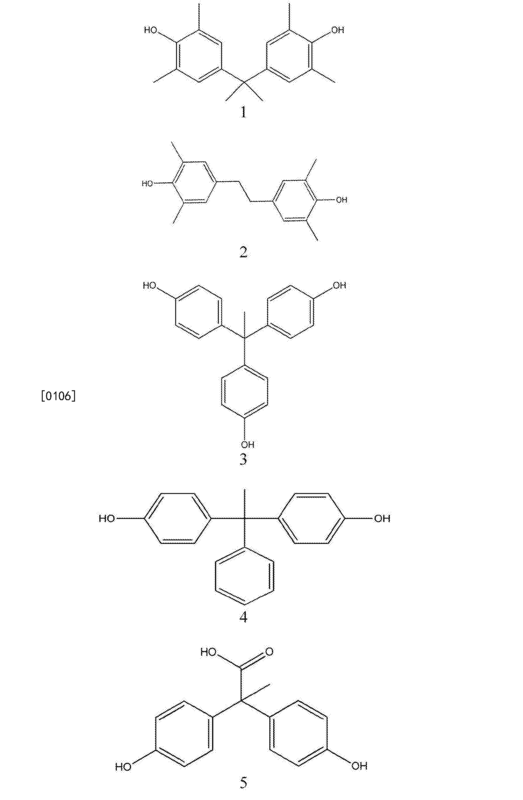 A method of preparing a dental material, which comprises admixing: a) a radical polymerizable resin, said resin comprising: i) at least two ethylenically unsaturated radically polymerizable group, and ii) a one or more aryl or heteroaryl groups segments, wherein the aryl or heteroaryl group segment having an oxygen atom attached to the ring, and (a) in relation to the oxygen atom and the ortho or meta position ring attached ethyl, propyl, isopropyl, butyl, sec-butyl or tert-butyl substituent group or (b) the two substituents bonded to both ortho positions relative to the oxygen atom; and the two or more aryl or heteroaryl groups unsubstituted segment through a methylene bridge (-CH2-) is connected; said resin contains less than 1000 parts per million or greater estrogenic activity bisphenol S estrogenic activity polyhydric phenol, b) a polymerization initiator; and c) optionally, a filler. BE1013613A3 (en) 2002-05-07 Resin composition for dental filling. FI72267C (en) 1987-05-11 Dispersioner of kvartshaltiga fastaemnen in liquid, the organic medium.